© 2002, © 2019 by Paul Freeman. Revised 2/14/19. examining an aircraft (curiously marked “Glider” even though it obviously has an engine) at Crawford Airport. when pilots performing stunt exhibitions over the Seal Beach Joy Zone (it was a short-lived rival to the famous Long Beach Pike from 1916-19) used the strip as a staging area. when he set an unofficial altitude record in 1917 & also did mock air battles. It was apparently also used by Earl Daugherty & other barnstorming pilots when they performed exhibitions in 1919-20. Many of these were produced under the direction of Wayne Abbott, who had been the Joy Zone’s director of fireworks, lighting, and aerial shows. Abbott’s son, Harry, who later became a well-known test pilot & first trainer/director of the Nationalist Chinese Air Force – learned how to fly at this airport. The company was granted a stock-selling permit by the State Corporation Department. head of the corporation & one of its incorporaters. A circa 1927 photo of William Crawford or L.R. 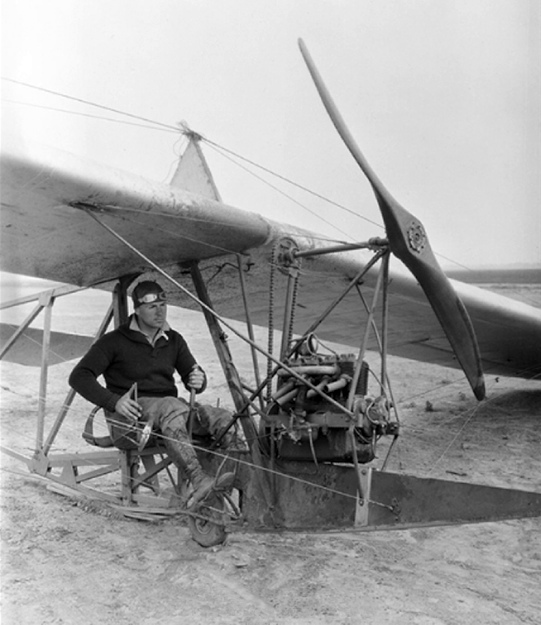 Crawford in a Crawford aircraft at Crawford Airport (courtesy of Larry Strawther). Larry observed, this “would seem to indicate the dirt strip had been operational as early as 1921. Crawford was apparently an innovator, and one of the first to place refrigeration on an airplane. In December 1928, the Hamilton syndicate of Nogales NM ordered 3 planes from the Crawford Airplane Corporation of Seal Beach, to be equipped for refrigeration. One plane was already under construction, the refrigerator to be operated by from an electrical dynamo generated from the ship while in flight. “Shrimps which cost 60 cents a pound here, may be had at 10 cents a pound in Chihuahua, Mexico. The syndicate intends to transport them by plane, speeding up the service, and lowering costs thereby. Either flaws in the idea or the stock market crash of a year later doomed this idea. In 1928-30 Crawford advertised regularly in Popular Mechanics — offering services in construction of engines, propellers, gliders & blueprints for ice sleds. The ads noted the propellers were made for Harley-Davidson, Indian & Heath-Henderson motorcyles. and with a $250,000 order from a Mexican syndicate, an enlargement of the plant became necessary. A 11/2/29 L.A. Times article mentioned "The William F. Crawford: Airport”, and established Crawford's credentials in the aircraft motor industry. He also had a good reputation for building propellers & motorcycle motors. and after that gliders seem to have been his main focus. There is one big article in Flying Magazine – which also pictures his son demonstrating the glider plane, which could be produced for $600. 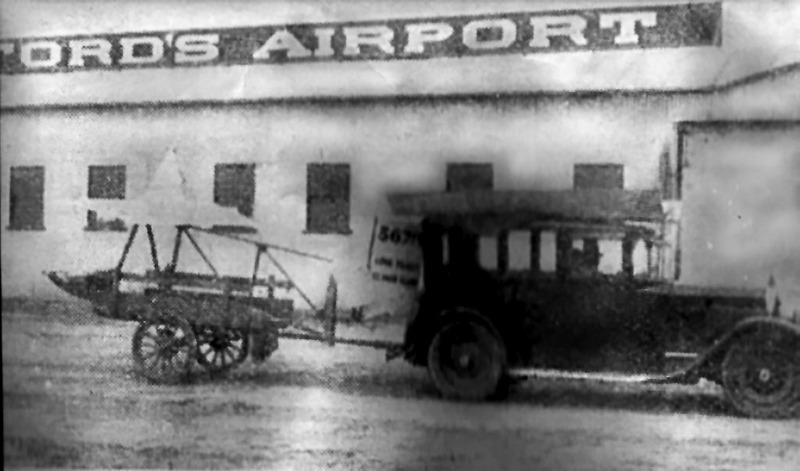 A circa 1920s photo of a glider being towed on a cart in front of a building marked “Crawford's Airport”. But Crawford’s airfield apparently also saw some use as a recreational airport. Pilots from around the area flew there to spend a day at the beach or to give beach-goers short airplane rides for a penny per passenger-pound. Charles Lindberg, Amelia Earhart, were said to have flown through there. Seal Beach resident Jim Templeton used to hang around the airport, cleaning planes, talking to the pilots & mechanics, sometimes even receiving free rides. On one ride, the plane developed engine trouble & landed in the field across from Zoeter School - Jim hopped out, ran across PCH, and was late to school. A 1928 aerial view depicted Crawford Airport to have an unpaved east/west runway & a single building on the northwest side. showed it to have an unpaved east/west runway & a single building on the northwest side. 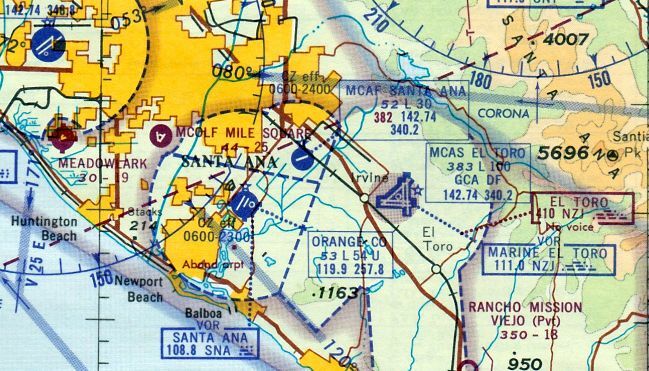 The earliest map depiction which has been located of Crawford Airport was on a 1930 LA County Rand McNally street map (courtesy of Kevin Walsh). 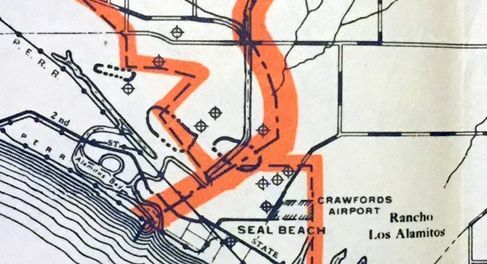 The 1930 "Southern California At A Glance" (courtesy of Kevin Walsh) depicted “Seal Beach Airport' as a rectangular property outline. 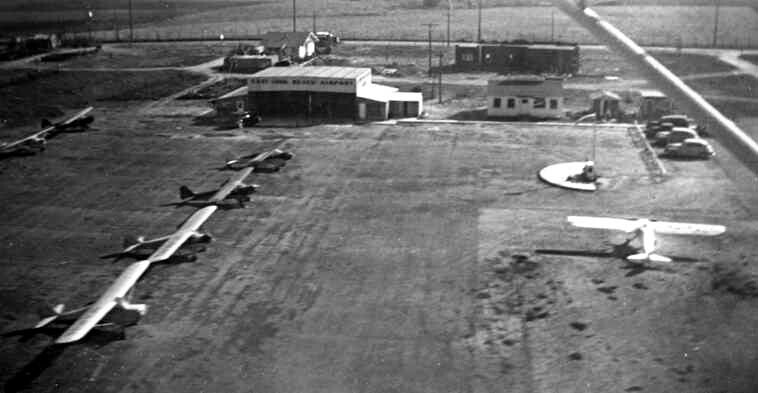 Crawford Airport was popular for another reason, too: In 1930 a diner opened across the highway & derived its name from the airport. The original sign stated: “GLIDE'ER INN & EAT Fish, Steaks, Sandwiches Tamales, Clam Chowder, Chili PRIVATE BOOTHS”. The brotherhood of fliers began using the inn as a sort of lodge hall. Clark Gable & many other celebrities ate there. Inside, aviation memorabilia covered the walls & model airplanes hung from the ceilings & the "world's largest hand-carved propeller" decorated the bar. A sign was mounted beside the sit-down counter: "All aviators are requested to sign our pilots register". Other pilots flew there to spend a day at the beach or to give beach-goers short airplane rides for a penny per passenger-pound. 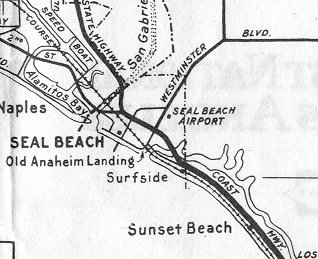 A 1931 map labeled the Seal Beach Airport on the east side of Westminster Boulevard. Larry continued, “In July 1931 Crawford had Southern California’s first air speed course (the nation’s second) certified along Ocean Ave (Coast Highway) just east of Crawford Field. 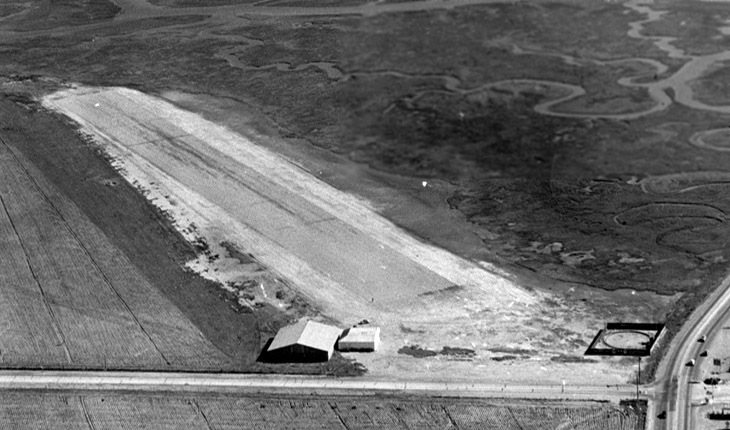 A circa 1930s U.S. Navy aerial view looking southeast at Crawford Airport, with Seal Beach Boulevard in the foreground. The field had a single unpaved east/west runway, with 2 small hangars on the northwest side. What was the strange enclosed square & circle structure at the intersection with Pacific Coast Highway? which depicted Crawford as a commercial/municipal field. with a single building on the northwest side. 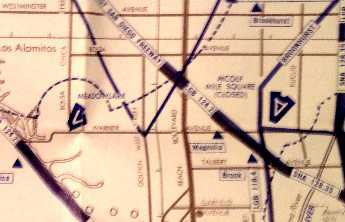 A circa 1935-36 street map (courtesy of Kevin Walsh) depicted Crawford Airport as a property outline. Larry continued, “By the mid-1930s all Crawford Field/Seal Beach Airport operations had been taken over by Wes Carroll & Clyde Schlieper. 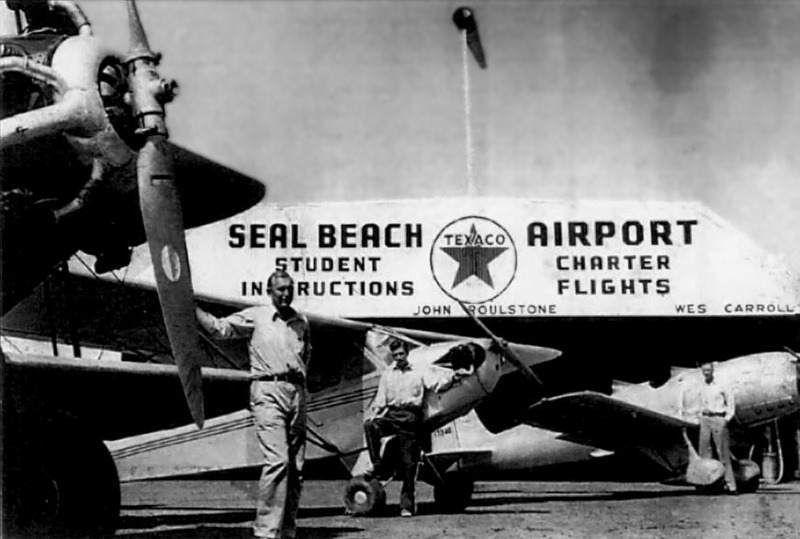 Sometime in the 1930s the field began being called the Seal Beach Airport. A circa late 1930s / early 1940s photo of instructors in front of Piper & Ryan aircraft & a hangar marked Seal Beach Airport. including putting in a seaplane landing & specializing in developing flight & speed recording instruments. This was just after the US Government announced the passage of multiple bills which called for increased military aviation facilities – especially in the Southern California area. A week or so later, articles mentioned the formation of Columbia Aircraft Associates for development of flight & speed instruments. 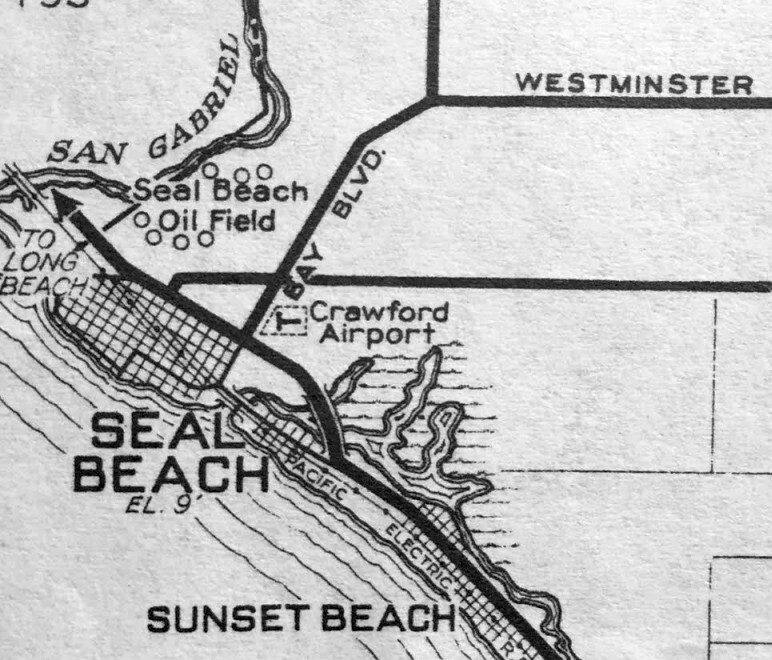 The 1941 Sectional Chart depicted Seal Beach as a commercial/municipal airport. for use by the naval pilots being trained at Alamitos & El Toro. Its designation of Field 21104 indicated it was on a heading of 211 degrees from Los Alamitos & a distance of 4 NM. as well as 2 “proposed” fields which were never built. 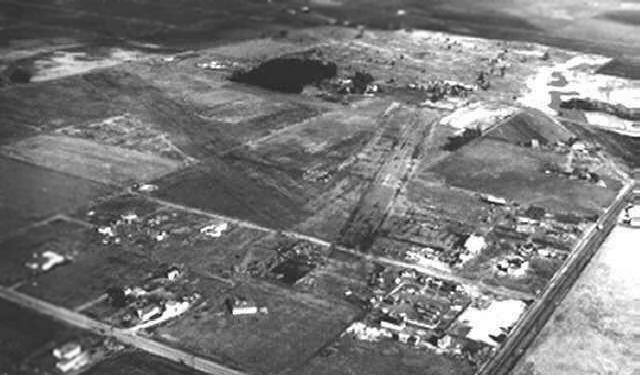 which depicted NOLF 21104 as an auxiliary airfield. 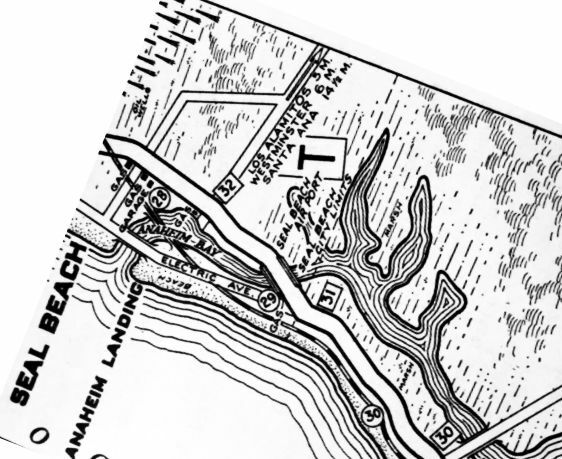 The 1943 USGS topo map no longer depicted Seal Beach Airport. the Seal Beach Airport Administration building had a big letter “R” on the front of the building. across from the Seal Beach City Hall where it became the Ration Board during the war. as it was no longer listed among active airfields in the 1945 AAF Airfield Directory (courtesy of Scott Murdock). 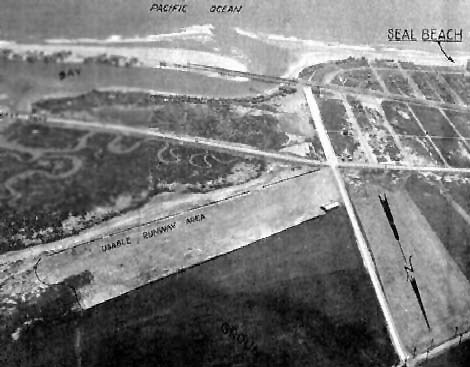 A 1952 aerial view showed the site of Seal Beach Airport covered by Navy buildings. 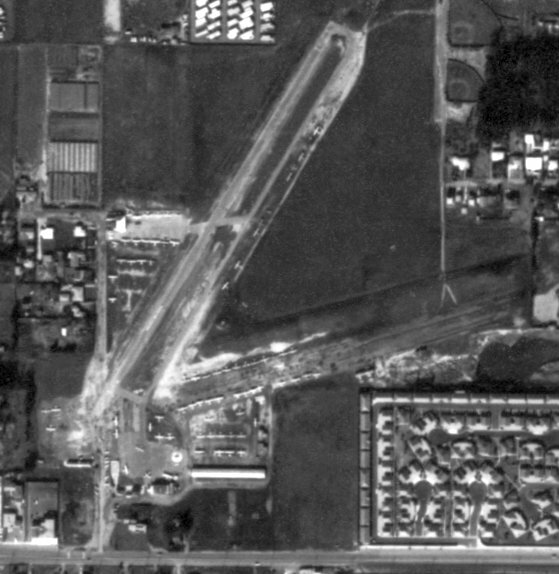 A 4/16/13 aerial view showed Navy buildings covering the site of Seal Beach Airport. could the rectangular concrete feature along Seal Beach Boulevard be the foundation of the Seal Beach Airport hangar? 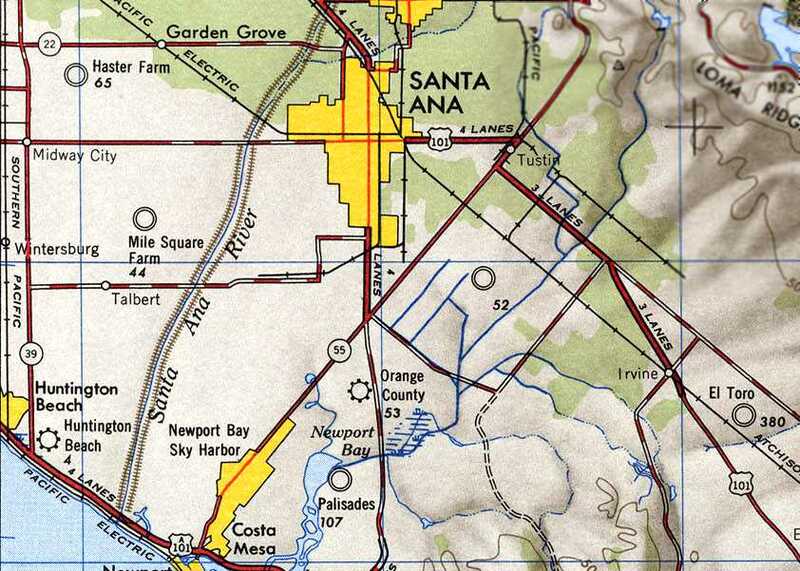 The site of Seal Beach Airport is located east of the intersection of Seal Beach Boulevard & Pacific Coast Highway. the asphalt area in the center-foreground with the characteristic “V”-shaped painted marking also seen on later Disneyland Heliports. via 15-minute helicopter flights provided on a scheduled route by Los Angeles Airways. The first location of the Disneyland Heliport was located near the intersection of the 5 Freeway & Harbor Boulevard. Guests would travel to & from the Disneyland Hotel by tram. 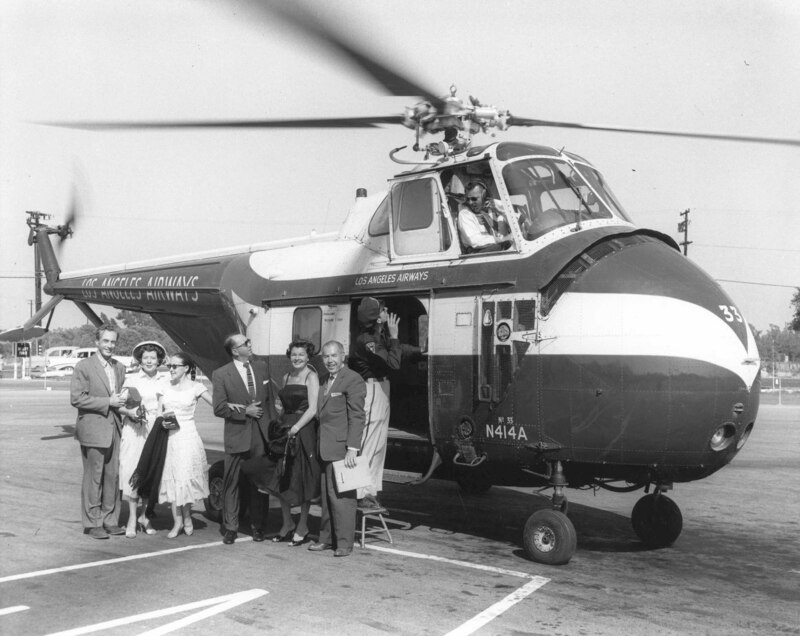 Disneyland Heliport service was initially provided by Los Angeles Airways using piston-engine Sikorsky S-55 helicopters. (and could seat up to 12 passengers, but probably carried much less in airline service). showing the Heliport to be an asphalt area with a characteristic “V”-shaped painted marking also seen on later Disneyland Heliports. 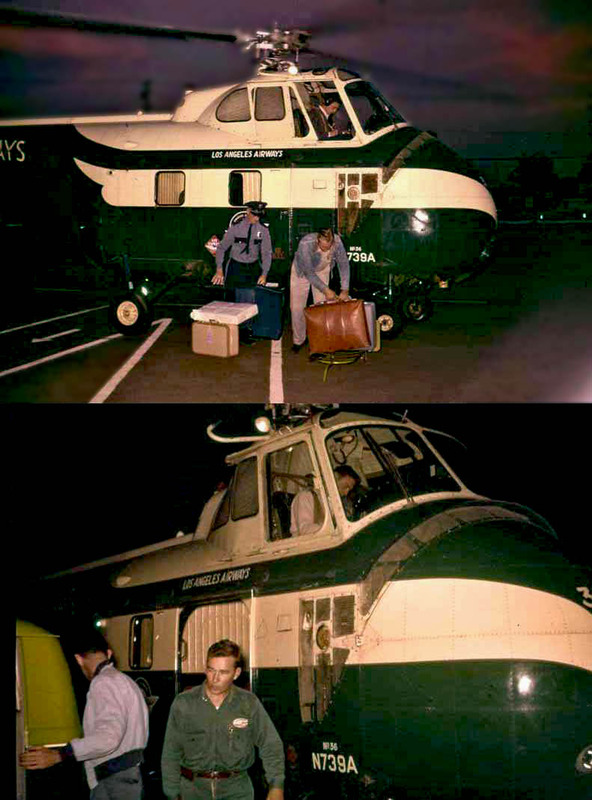 Two 1956 photos of a Sikorsky S-55 of Los Angeles Airways being loaded with passenger luggage at the Disneyland Heliport. 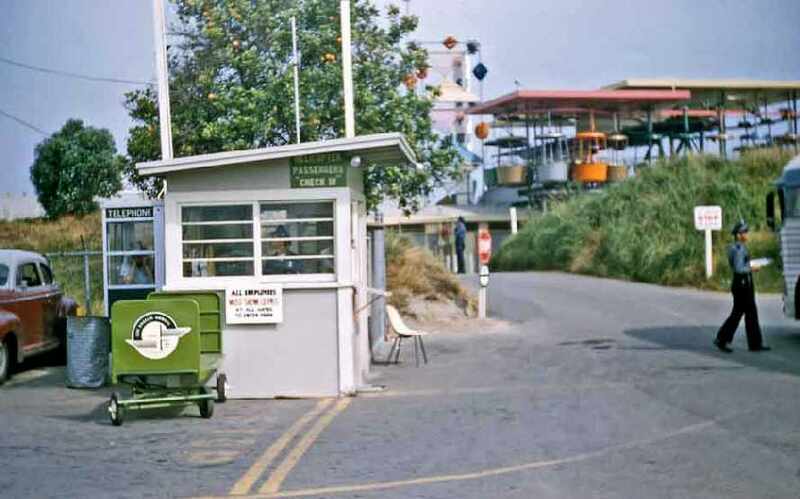 A 1956 photo of the “backstage” heliport entrance behind the Tomorrowland Skyway Station. and the luggage cart with the Los Angeles Airways logo. 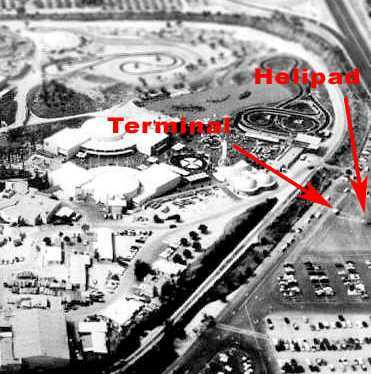 annotated by Scott O'Donnell to show the terminal shack & helipad of the 1st Disneyland Heliport. A circa 1950s photo of a Los Angeles Airways S-55 at the Disneyland Heliport. A undated (circa 1950s?) 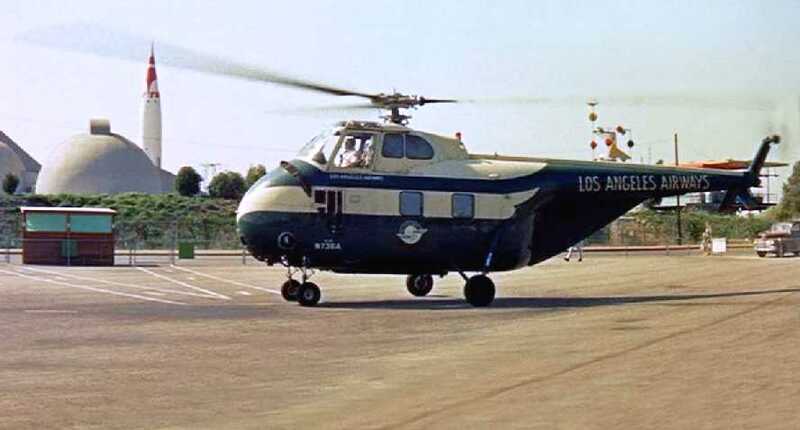 photos of a Sikorsky S-55 of Los Angeles Airways at the Disneyland Heliport. 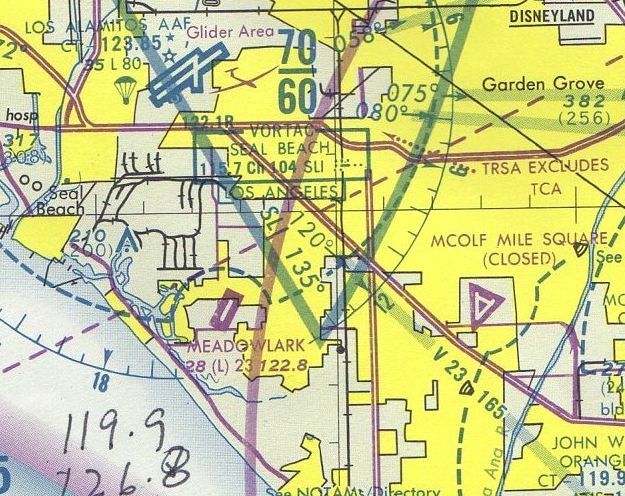 therefore displacing the original location of the Disneyland Heliport. The heliport was replaced by a new location 140 yards to the south. which by then had been displaced by the railroad tracks & covered with parking. 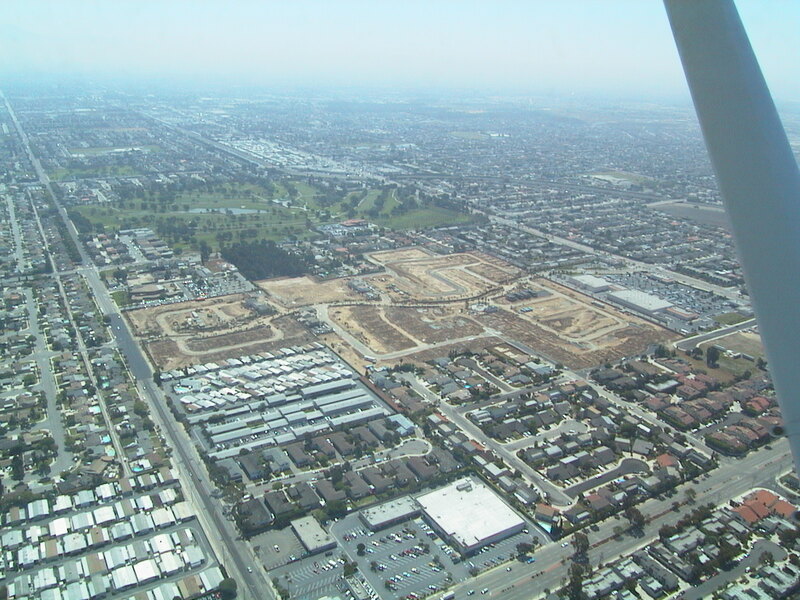 A 2006 aerial view showed the site of the original Disneyland Heliport having been covered with further development. Thanks to Jeff Knapp for pointing out this airfield. 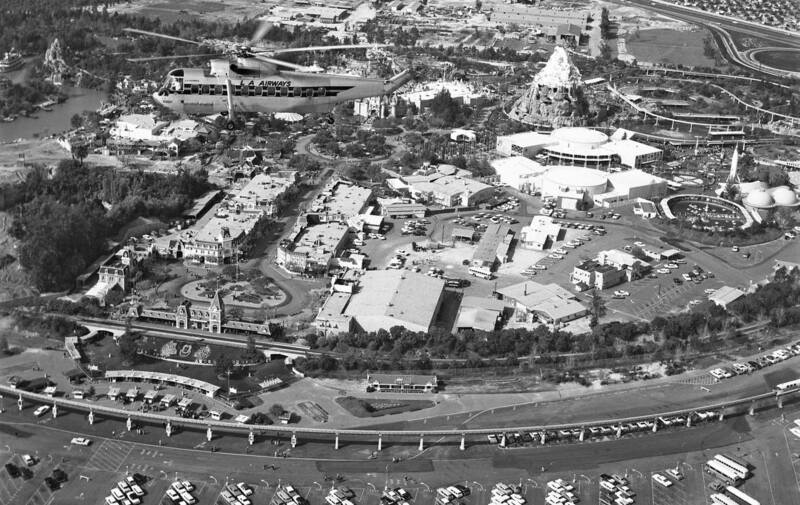 A June 1960 aerial view annotated by Scott O'Donnell to show the 1st & 2nd locations of the Disneyland Heliport. The heliport was replaced by a new location just 140 yards to the south. 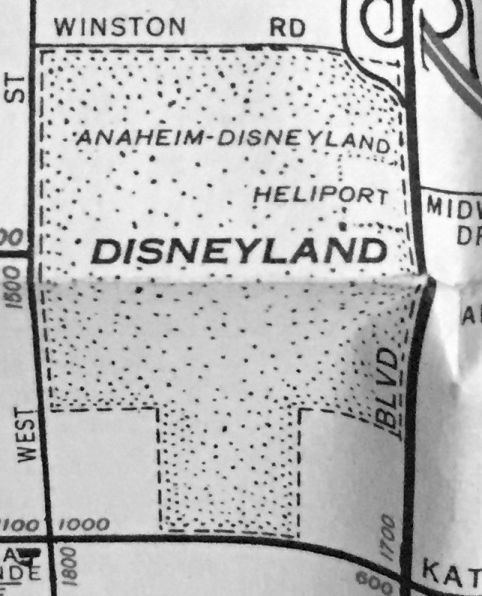 A 1960 street map depiction of the Disneyland Heliport (courtesy of Kevin Walsh). 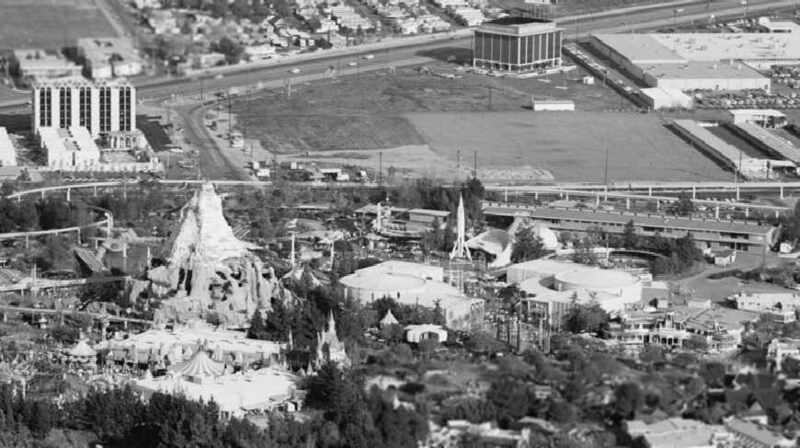 as in 1960 it was replaced with yet another heliport, over 1,000 yards to the west, on the southwest side of the theme park. 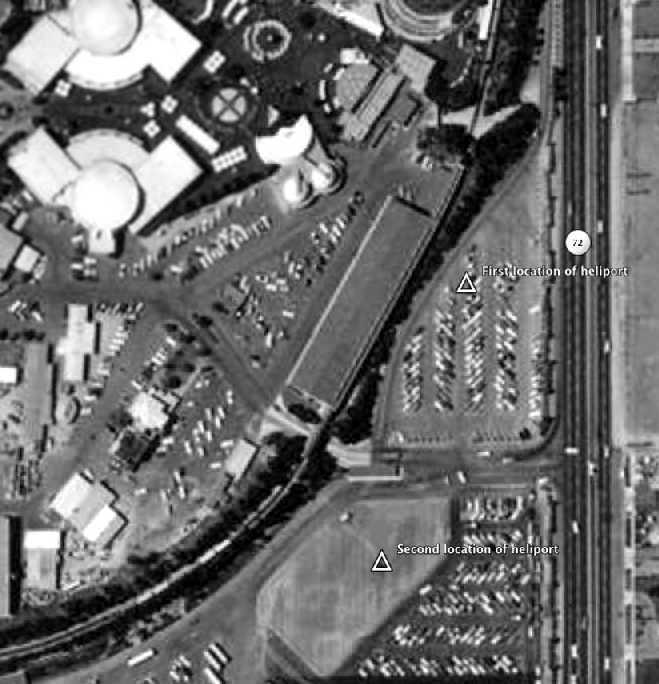 showing the abandoned 2nd location of the Disneyland Heliport on the parking lot just beyond the monorail track. 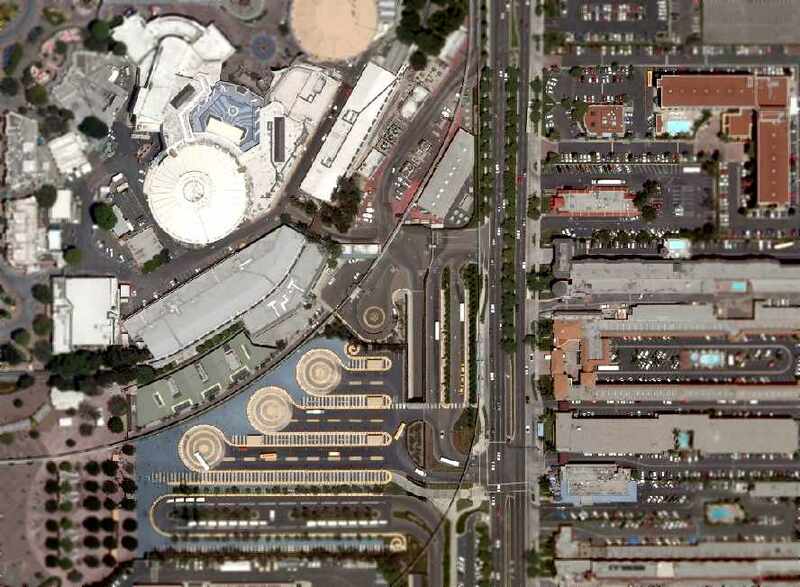 A 2006 aerial view showed the site of the 2nd location of the Disneyland Heliport having been covered with the Disneyland Entry Esplanade & Tram complex. A circa 1961 photo of a Los Angeles Airways S-55 at the Disneyland Heliport (courtesy of Don Ballard). was moved to its final location on the southwest side of the theme park. An undated photo from a circa 1961 brochure showing the Disneyland Heliport terminal building (courtesy of Don Ballard). An artist's conception from a circa 1961 brochure showing a never-built Disneyland “Tri-City Heliport” (courtesy of Don Ballard). 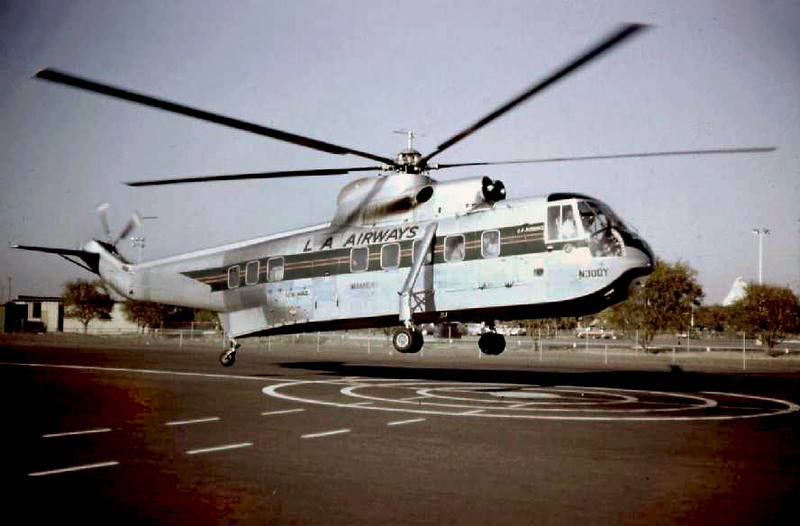 A 1961 photo of a Sikorsky S-62 departing from the Disneyland Heliport. which had been purchased for $650,000 apiece. These presumably replaced the much smaller S-55 helicopters on the Disneyland run. The S-61L could seat up to 28 passengers, and cruised at 140 mph. A circa 1962 aerial view looking northwest at a Los Angeles Airways Sikorsky S-61L overflying Disneyland (courtesy of Donald Ballard). (this attribution link required with use of the photo outside of Wikipedia: EditorASC). Note the Disneyland Matterhorn just visible in the background on the right. N300Y was the prototype Sikorsky S-61L. Kelly recalled, “When I was in 2nd grade I had a girlfriend. On her birthday her parents drove us to LAX, and we all flew to Disneyland on the LA Airways S-61 helicopter. It was totally cool, we landed on the helipad at the old Disneyland Hotel. and the distinctive “V”-shaped painted marking leading to the terminal building, also seen on the previous Disneyland Heliports. 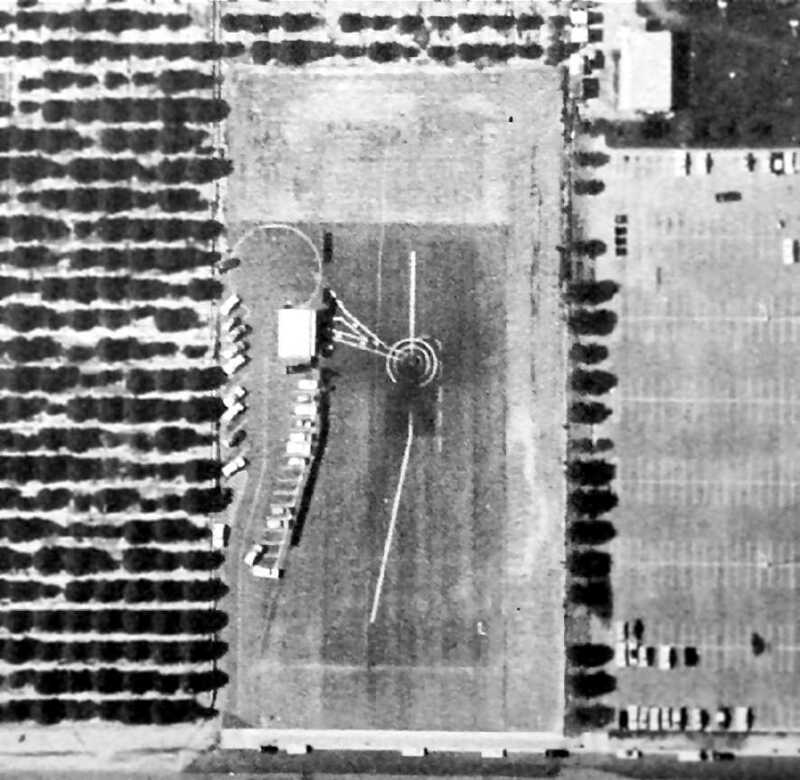 Note the orange groves adjacent to the west side of the heliport. it quickly became evident that helicopter airlines were not financially viable. when S-16L N303Y was cruising at 2,000' near Paramount, after departing the Disneyland heliport, en-route to LAX. At about 5:50 PM, Flight 841 suddenly broadcast a distress message: "L.A., we're crashing, help us!" There were no survivors among the 20 passengers & 3 crew. The aircraft was destroyed by the impact & subsequent fire. The crash was caused by a mechanical failure in the blade rotor system, which then allowed one blade to strike the side of the fuselage. The other 4 blades were then thrown out of balance & all 5 rotor blades broke & then the rear fuselage & tail separated from the rest of the airframe. was operating Flight 417 from Los Angeles International Airport to the Disneyland Heliport. and departed the ramp at Los Angeles as Flight 417 at 10:26. The VFR flight was cleared by Los Angeles Helicopter Control to take off & proceed eastbound at 10:28. At 10:29 the flight reported to Hawthorne Tower that it was departing LA eastbound along Imperial Boulevard at 1,200'. At 10:32 Helicopter Control advised, "LA 417, 7 miles east, radar service terminated." The flight acknowledged, "417 thank you." This was the last known radio contact with the flight. The aircraft crashed in a recreational park located in a residential area in Compton, with the loss of all 18 passengers & 3 crew. the 13-year-old grandson of Clarence Belinn, the founder & president of Los Angeles Airways. The aircraft was destroyed by impact & fire. The entire fuselage, both engines, main rotor head assembly, 4 main rotor blades, and the pylon assembly were located in the main impact area. was located approximately 0.25 miles northwest of the main wreckage site. Minor parts associated with this rotor blade where scattered over a 3-block area northwest of the park. in the shank of the spindle adjacent to the shoulder in the inboard end of the shank. causing separation of the blade which made the aircraft uncontrollable. The fatigue crack originated in an area of substandard hardness & inadequate shot peening. Statements were obtained from 91 witnesses. when a loud noise or unusual sound was heard. A main rotor blade was either observed to separate or was seen separated in the vicinity of the main rotor disc. As the helicopter fell in variously described gyrations, the tail cone either folded or separated. Flight 417's Sikorsky S-61L, N300Y, was the prototype for the S-61L, and had accumulated 11,864 total flying hours prior to the day of the accident. The S-61s were grounded until the problem was fixed. Rick Shadforth recalled, “I worked for LAA as an avionics tech in 1970, during the last few months that LAA remained in business. We had 2 S-61s that flew scheduled hops to Disneyland as well as Newport Beach. I made several trips out to Disneyland to work on some ground support equipment. We also assisted the Orange County Sheriffs office, providing airborne observations when a bunch of hippies took over Tom Sawyer's Island. The Disneyland Heliport presumably closed at that point, having operated for a total of approximately 15 years in 3 different locations. 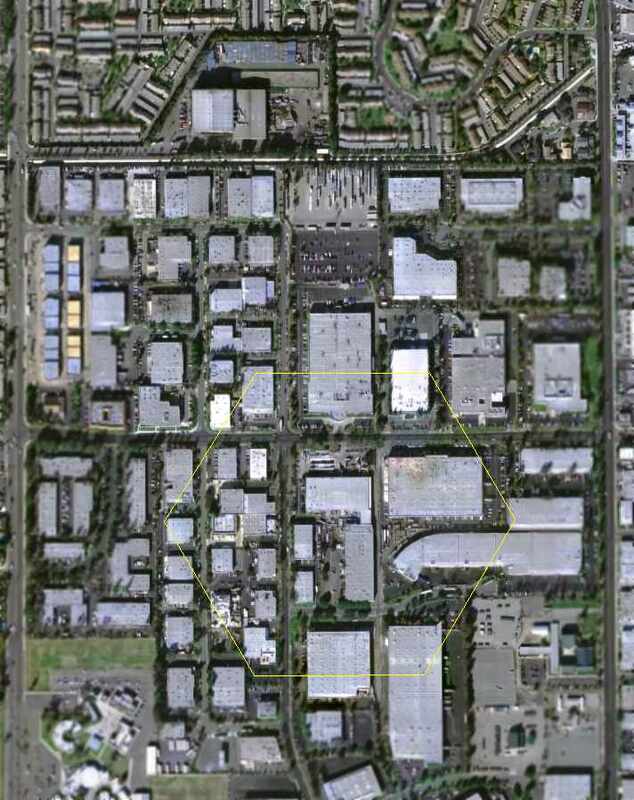 An aerial view annotated by Scott O'Donnell to show the sites of all 3 locations of the Disneyland Heliport. 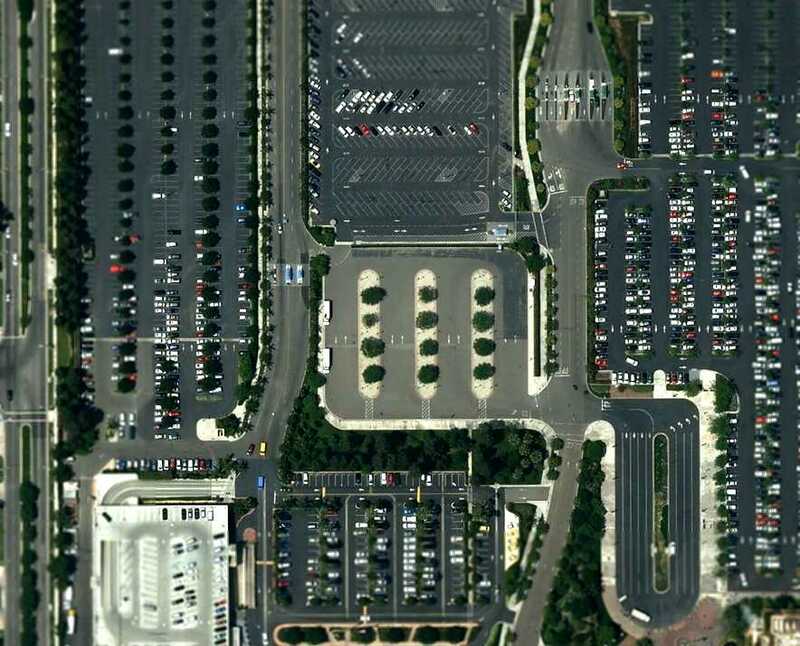 now unrecognizable as such, now having parking lots for the Disneyland Hotel. 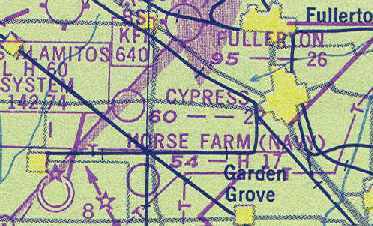 "Cypress" Airfield, as depicted on the 1947 LA Local Aeronautical Chart (courtesy of Tim Zukas). Not much is known about this small flying school airfield, including its date of construction. as it was yet depicted on the August 1945 San Diego Sectional Chart (courtesy of Chris Kennedy). was on the 1947 LA Local Aeronautical Chart (courtesy of Tim Zukas). It depicted Cypress Airfield as having a 2,200' unpaved runway. Claudia Skapik recalled, “My father George Owens ran the Cypress School starting in about 1947.
and starting up his new operation at Cypress School of Aeronautics on 4/15/47. In the beginning it was an airfield & a couple of buildings. (he owned a meat packing company & was the money of the partnership) started the business after the war. Apparently the Government use to fund people who wanted to learn to fly [through the G.I. Bill]. My mother said that after the Government stopped paying people to learn to fly it was no longer profitable to run the school. Bruce Pasarow reported, “I have 2 advertisements (6/12/47 & 6/19/47) encouraging people to visit & take flying lessons at the Cypress Airpark. Another item is an article & an advertisement in the 6/12/47 [Buena Park News] about the opening of the Cypress airfield. as consisting of a single 2,300' northeast/southwest runway within an irregularly-shaped outline. 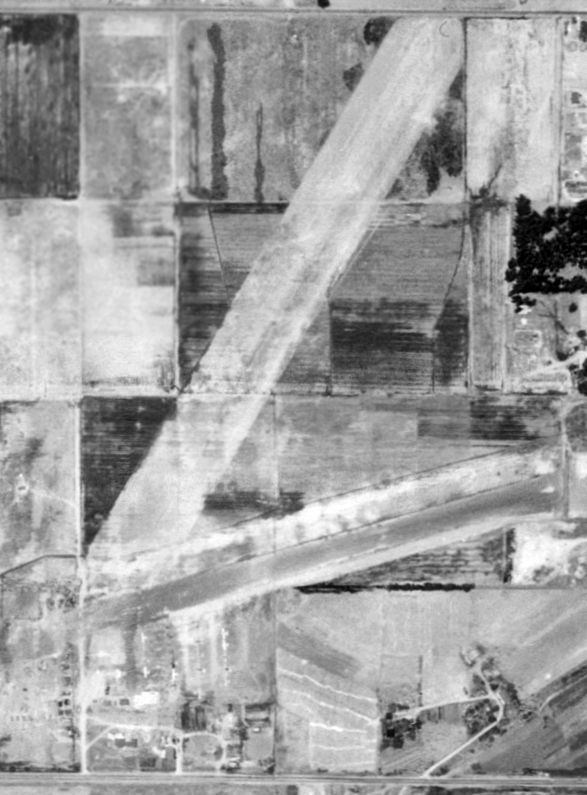 The earliest photo which has been located of the Cypress airfield was a 1953 aerial photo. It depicted the field as having a single 2,300' northeast/southwest runway. and a dozen light aircraft were parked on the northwest side. but the number of aircraft visible on the field had plummeted to only 3.
and a school covered the southern portion. had been reused as the site of Orangeview Junior High School & a hospital. 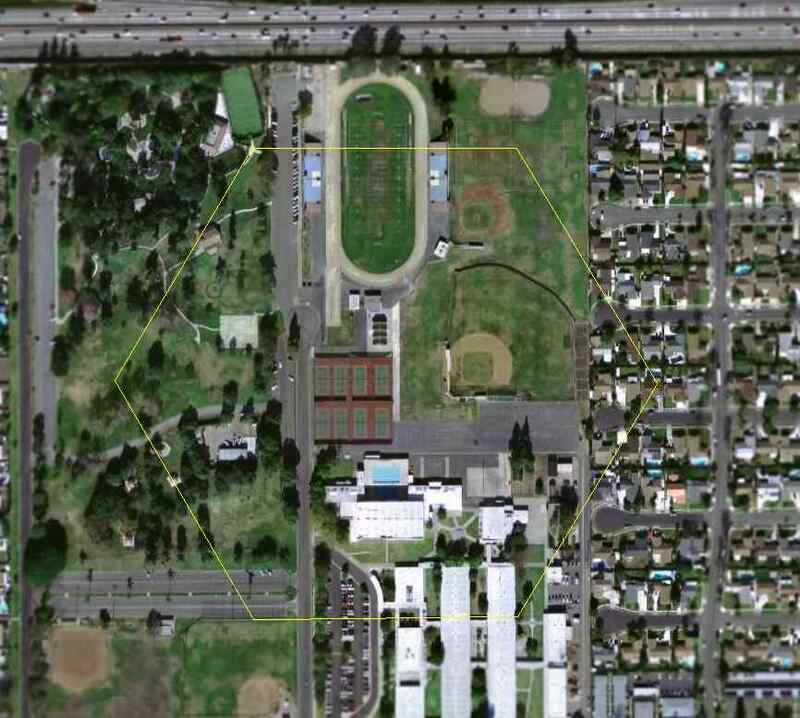 A 3/8/11 aerial photo annotated by Scott O'Donnell to show the layout of the Cypress School of Aeronautics Airfield. Not a trace of the airfield appeared to remain. of the intersection of South Knott Avenue & Lincoln Avenue. A 7/1/1947 aerial view of East Long Beach Airport (from the UCSB Library). eventually had the unfortunate coincidence of being located on land which eventually became too valuable. 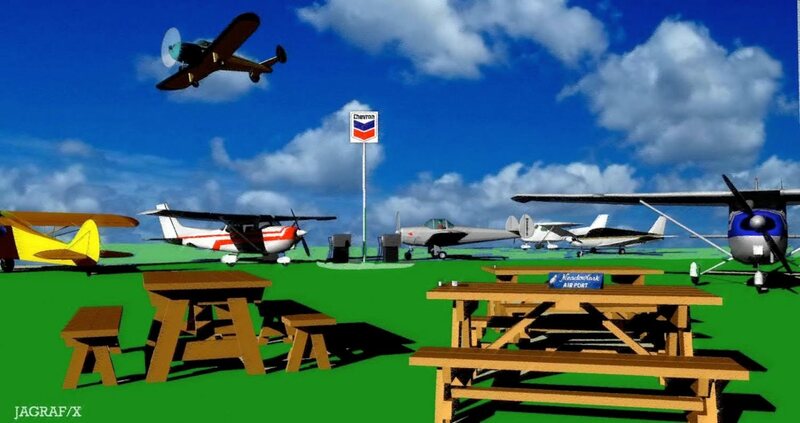 a gravelly oasis where you can cruise for burgers in your Cessna." 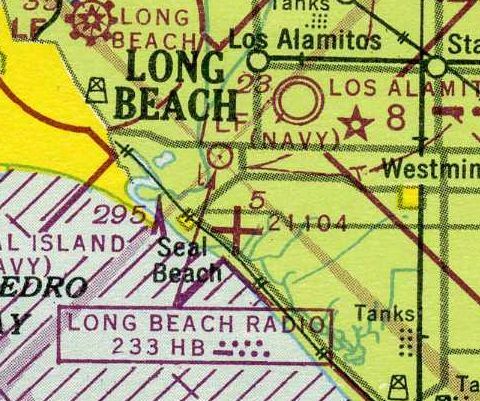 East Long Beach Airport was not yet depicted on the August 1945 San Diego Sectional Chart (courtesy of Chris Kennedy). 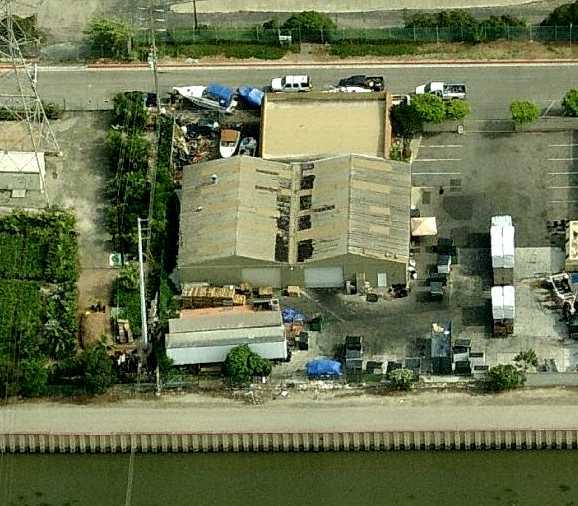 According to Rex Ricks, “East Long Beach Airport... was owned by Col. Willsie & partner. 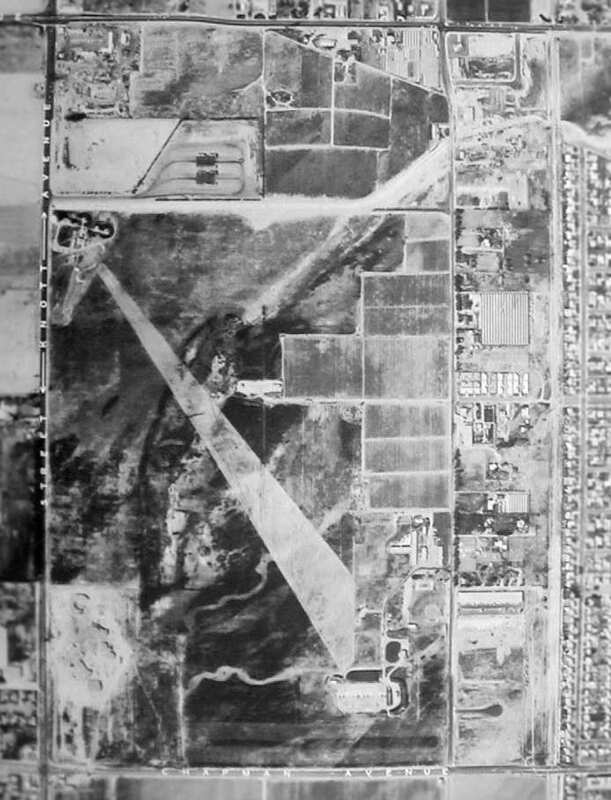 The earliest depiction of East Long Beach Airport which has been located was a 7/1/47 aerial view (from the UCSB Library). 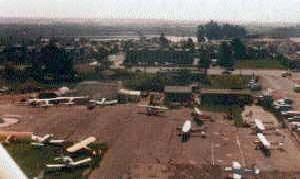 with a ramp with several small buildings & a group of light aircraft at the southwest end. fuel pump, and several tailgragger single-engine planes. depicted “Sunset Beach” Airport as having a 1,900' unpaved runway. An undated aerial view looking north at East Long Beach Airport from the 1950 Air Photo Guide (courtesy of Kevin Walsh). 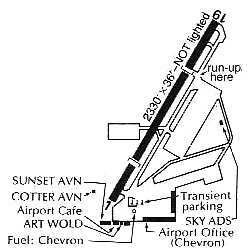 The guide described East Long Beach Airport as having two 2,000' oiled paving runways, oriented east/west & northeast/southwest. It listed the managers as Richard Willsie & Charles Hopton. A photo by Rex Ricks of a automobile license plate frame advertising East Long Beach Airport. The 1950 Sectional Chart (according to K.O. 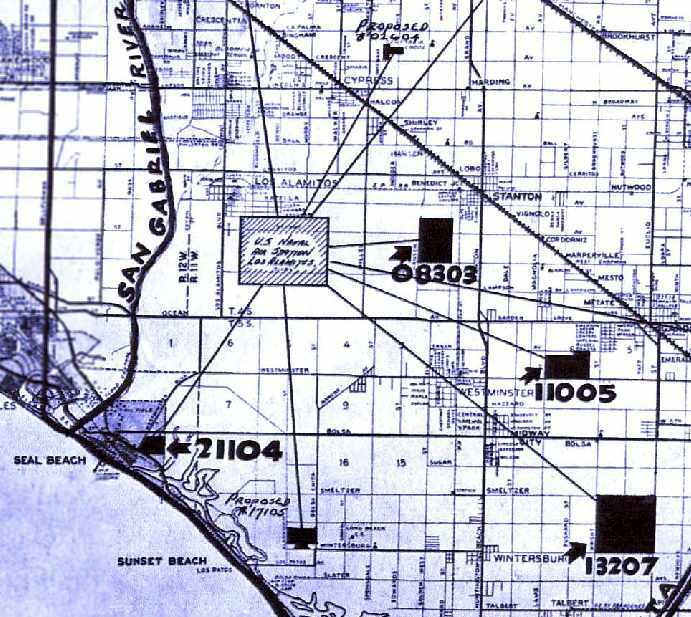 Eckland) described East Long Beach as having three 2,400' dirt runways. A 12/26/52 aerial view of Meadowlark Airport (from the UCSB Library). 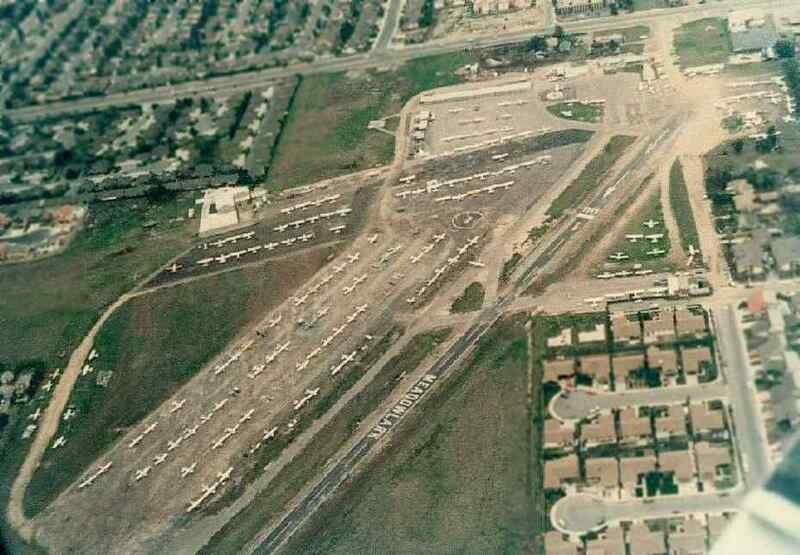 An early (undated) aerial view looking northeast at East Long Beach Airport. 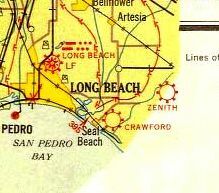 "East Long Beach" Airport, as depicted on the September 1955 San Diego USAF Sectional Chart (courtesy of Chris Kennedy). The Aerodromes table described the field as having 2 "oil mix" runways, the longest being 2,050'. The airfield was next renamed Sunset Beach Airport. Bob Cannon recalled, "My first landing at Sunset was 9/3/55 in my 7AC. First time to try the beach air enhanced hamburgers. Got hooked from then on! I have a 1956 LA Local [Aeronautical Chart]. L16 is [listed as] Sunset Beach." gave Abe Paster $8 for my first flying lesson in a 7AC Champ, wished me a happy 12th birthday, and told me to be home before dark. Wah hoo! It was nearly a year of weekends loading clay pigeons in the trap house at my gun club before I'd amassed enough money to begin flight training in earnest. Abe Paster was still there in 1960, but Harry Ross had the FBO at mid-field with a ramp full of Cessnas equipped with gyros! Harry, a former mayor of Seal Beach who'd spent much of WW2 ferrying multi-motor transports into the Pacific theater from Long Beach, had taken over the airport lease. The new Cessna 150s rented for $9.50/hour wet, but they were an obvious step nearer the DC-7s & Connies I had aspired to fly in the future. My second flying lesson was in a straight-tail Cessna 150 with CFI Ed Rice, who'd flown F-4U Corsairs with the USMC in the Korean conflict. Eric continued, “By Christmas that year, Ed had me flying mostly under the hood & in Harry's Cessna 172.
had expressed interest in my progress as a flying student, and I invited her to join me & my instructor for a flight in the 172. I was about to introduce her to Harry Ross when I saw by his stunned expression & her grin, that they had already met. Unknown to me before that moment, Ms. Beatrice Medes was a former WASP, Class of 43W3. 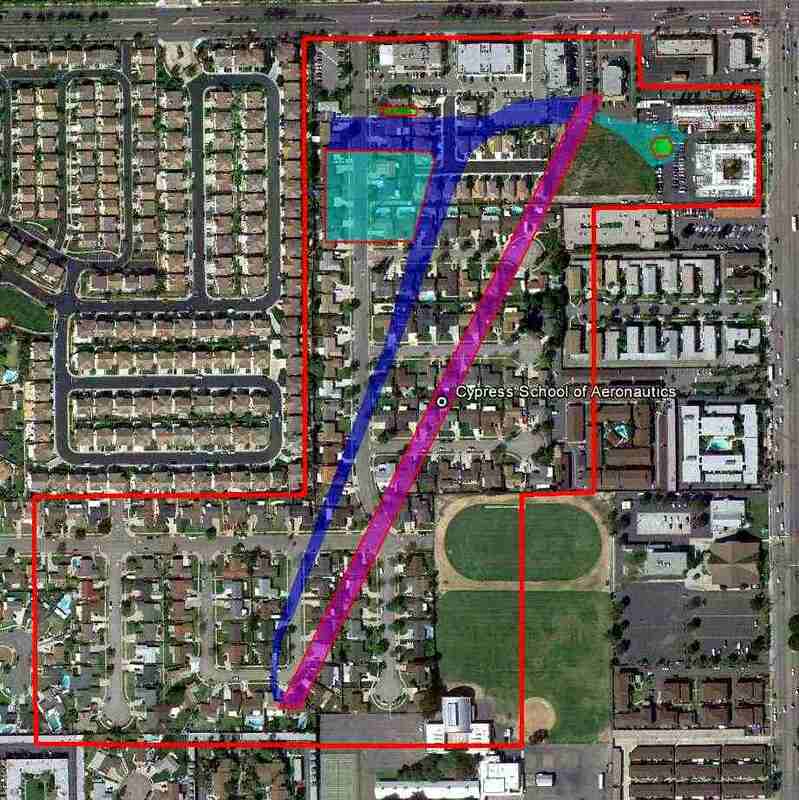 Eric continued, “The real estate business for single family homes was really booming across Heil Avenue, on the airport's north boundary. Harry began getting noise complaints in alarming numbers. There was a lady over there somewhere, who'd phone noise complaints in to the police even when we were completely fogged in & not flying. Eric continued, “One of those clear, beautiful Saturday mornings when everybody was flying in to shoot a few landings, Harry asked me to join him in a house-buying adventure. The developer had a model home on display right on the north side of Heil & exactly on the extended centerline of our Runway 19. During a tour of the house Harry pointed out to the salesman that while no airport appeared on the map in his sales brochure, there sure were a lot of little airplanes flying low over the house. The salesman explained they'd left the airport off the map because they'd already formed a homeowners' group that would have 'that little nuisance across the street' shut down forthwith. Eric continued, “Harry did buy that very house. It turned out to be not only a great investment, but also a useful approach aid. from where a bush pilot with a Cessna 180 would take them up into the eastern Sierras. He'd then fly the empty Aero Commander down to Lone Pine & load up about 600 pounds of freshly baked sheepherder's bread at Dan Schaat's bakery for sale in Safeway markets. by putting Harry's back porch light in line with the big illuminated sign at the Shell Station on the corner of Warner & Bolsa Chica. When Harry's porch light disappeared under the nose, it was time to get the last notch of flaps, pitch down to maintain Vxse, and voila! Eric continued, “The runway was more than long enough to handle the Aero Commander. Young Gary Morehouse (a future Continental Airlines captain) built up a lot of multi-motor hours on it in the family Piper Apache. Ten years later & after the runway had been paved, I flew a Cessna 310Q in for breakfast several times... two-up; before the day warmed up; and with a little on-shore breeze always welcome. installing 4 of the Link ANT-18 'Blue Box' trainers he'd run as chief of the flight simulator training shop at NAS Los Alamitos. I kept the place swept out & the coffee pot fresh there during February & March of 1961, in exchange for about thirty hours of Link time. Eric continued, “I think it was sometime in late1961 or early 1962 that Harry Ross was lost somewhere between Utah & home. Harry's widow, Elaine, took over the FBO & re-married to Hamilton 'Ham' Ward, a high school teacher from Garden Grove who'd recently licensed as a CFI. By September of 1963, they'd relocated the FBO from mid-field to Abe Paster's old digs across the entry road from the Quonset hut. Ed Rice was still instructing, but ailing, and it was Ham Ward who soloed me there on my 16th birthday. The runway had been paved by then, and the name changed to Meadowlark. as having a single 1,900' road mix Runway 1/19, and the operator was listed as Abe Paster. Rick Truofreh recalled, “My next flight was at the age of 6 , from Meadowlark Airport in a Piper Tri-Pacer. The pilot let me take the controls for a minute.... Wow! 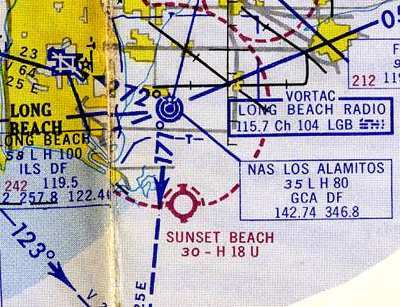 "Sunset Beach" Airport, as depicted on the March 1963 LA Sectional Chart (courtesy of Bob Cannon). The airport had been renamed "Meadowlark"
by the time of the August 1963 San Diego Sectional Chart (courtesy of Bob Cannon). described Meadowlark as having a 1,900' hard-surface runway. which depicted the field as having a single paved northeast/southwest runway with a parallel taxiway. depicted Meadowlark as having 2 paved runways, with the longest being only 1,900'. 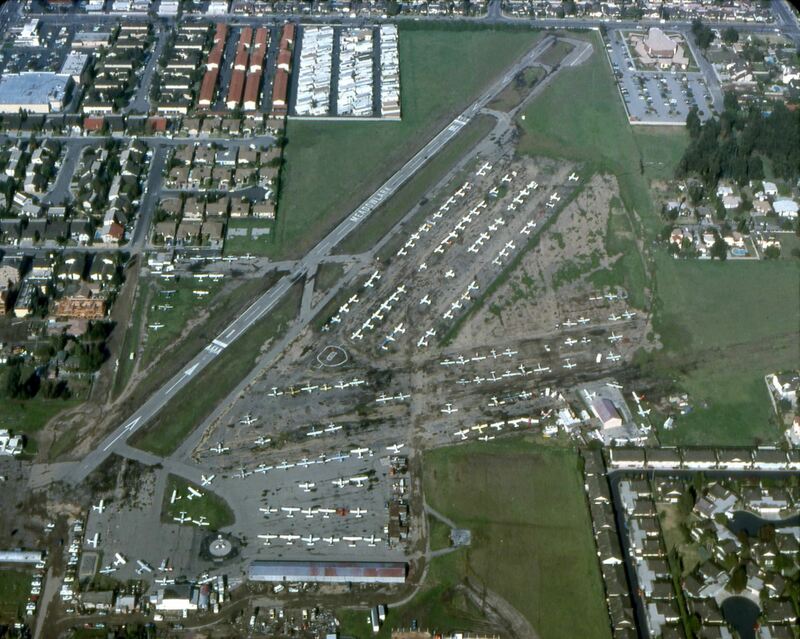 A 7/2/67 aerial view of Meadowlark Airport (from the UCSB Library). which was renowned among California pilots for being an extremely short runway. eldest son Art took over & actively began managing the airport operation for 20 years until its closure in 1989.
collected landing fees on his bicycle, pumped av fuel, and maintained just about everything else. Art’s sister Betty was the cheerful smiling face assisting in the operation of the airport. She kept the office running, maintained the books, pumped gas & assisted the customers. Harry Corrigan recalled, “Meadowlark.. I used to fly out of there about 1970. It was in an Aeronca 2-seater, with my dad always in the back seat. I think the Aeroncas rented for $4/hour. I never was licensed, but my dad says I often did the whole flight myself, with him never touching the controls, so I consider myself a light plane pilot. along with a former crosswind runway. Over 70 light aircraft were visible on the field. 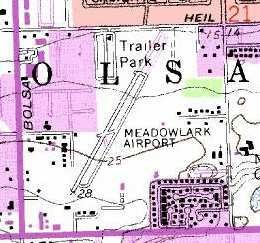 The 8/14/75 LA Helicopter Aeronautical Chart depicted Meadowlark as having 2 paved runways. The ramp at Meadowlark, 1977. Aerial view of Meadowlark, © 1978 by Chris Bell, used by permission. Rex Ricks observed, “Our house on end of Old Pirate Lane is at lower left edge. showing how close the houses were surrounding the field by that point. 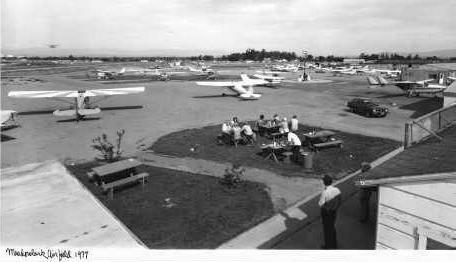 An undated photo by Linda Liem (courtesy of Pat Nerio) of the airport crowd hanging out at Meadowlark Airport. it was a big patch of weeds in the 1970s. So there was no possibility of hitting any windows. 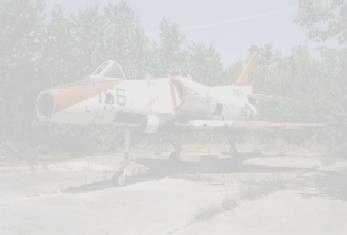 Ron Jagodinski recalled, “I lived near Meadowlark Airport in the 1970s. Landings cost about $5 if anyone was present at the Meadowlark Cafe to take your money. Folks from Brackett Field & virtually all over would drop down to stretch their legs & have breakfast at the Meadowlark Cafe. The largest aircraft we ever saw land there was a Beech 18 with 2 people in it. The old cafe was a great place for airplane discussions. One sunny Saturday morning an entire squadron of Globe Swifts dropped in out of nowhere for breakfast. Finished with breakfast & showing off their restorative work on the Swifts, they all took off in-line with a tremendous roar accompanied by low airspeed - if noise was power. From the downwind leg, Meadowlark looked about as big as the USS Langley. and the ever-present Quonset Hut that got plugged so many times by wayward aircraft." A circa 1978-79 picture by Bob Cannon of his PT-17 flying inverted off the coast near Meadowlark Airport. Bob recalled, “I got in the good graces of a camera representative for Nikon who set up the remote cameras for me. It was sort of special back then. We also made a movie with air shots by mounting a camera on the fuselage in the small inspection hatch near the tail. over the windsock when my wedding was being held." precipitated negative feelings toward Meadowlark Airport. Bob Cannon recalled, "That accident precipitated the beginning of all of my problems with the city of Huntington Beach. The city council was staffed mainly by developers, and they wanted the airport for development." 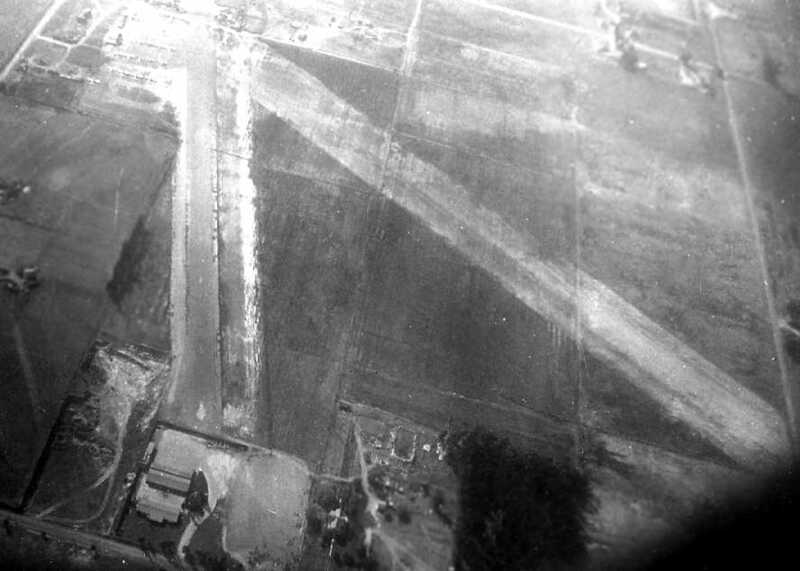 Aerial view of the ramp at Meadowlark, date unknown. which depicted Meadowlark as having a single 2,300 paved runway. USGS topo map 1981 (courtesy of Dann Shively). Coastal Aviation, Sky Ad, and Aircraft Services. A 1982 photo of a very popular Meadowlark Airport ramp. A Flight Simulator scenery re-recreation by Richard Finley of a Waco UPF-7 performing aerobatics over Meadowlark. 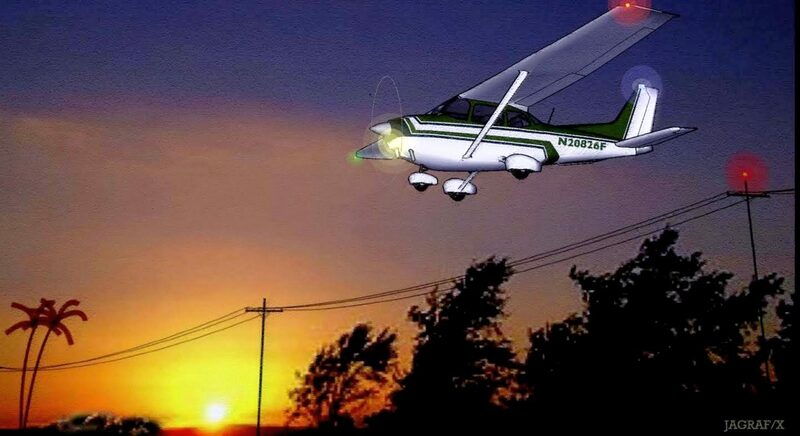 that I flew to several times in the early 1980s when I first got my license. Small, fun, friendly, and surrounded by conniving Southern California real estate developers. Meadowlark had a large paved ramp area, which accommodated 300 based light aircraft by 1986. The Meadowlark Café was a popular pilot eatery. 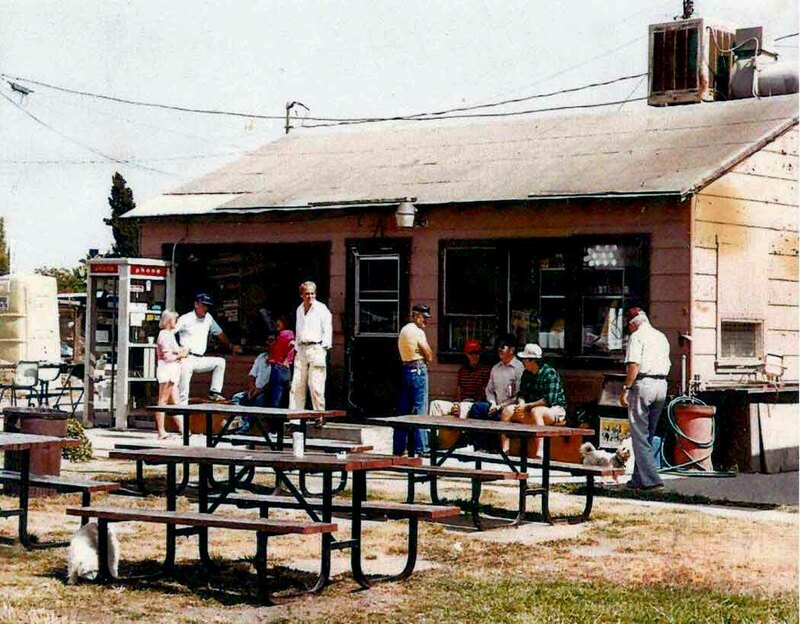 A late 1980s photo by Chris Bell of signs for Meadowlark Airport & its cafe. from the 8/4/89 issue of the Los Angeles Times (courtesy of Bob Cannon). with a parallel taxiway & large paved ramp on the east side, and a small paved ramp on the west side. Hangars were located along the south side of the field. The operators were listed as Sunset Aviation, Art Wold, Cotter Aviation, and Sky-Ads. 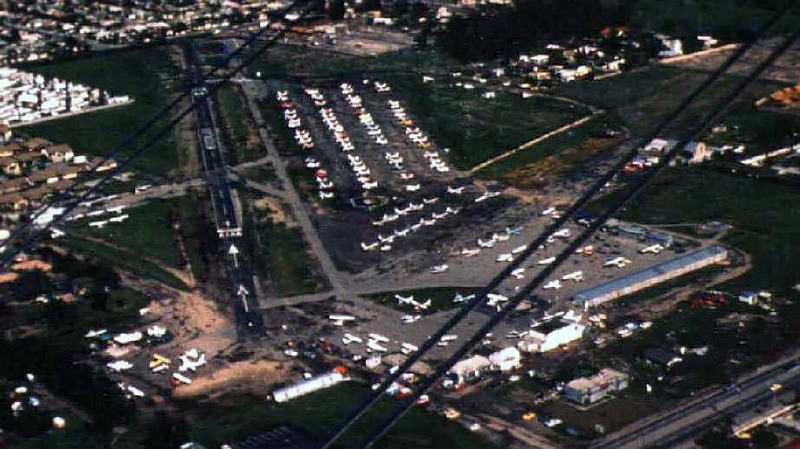 A 1989 aerial view by Dave Stevens looking north at Meadowlark Airport in its last year of operation, showing a very popular little airport, with dozens of light general aviation aircraft. According to Linda Liem (who along with Chris Austin owned Sunset Aviation), Meadowlark closed in 1989. Construction to redevelop the airport property started later the same year. 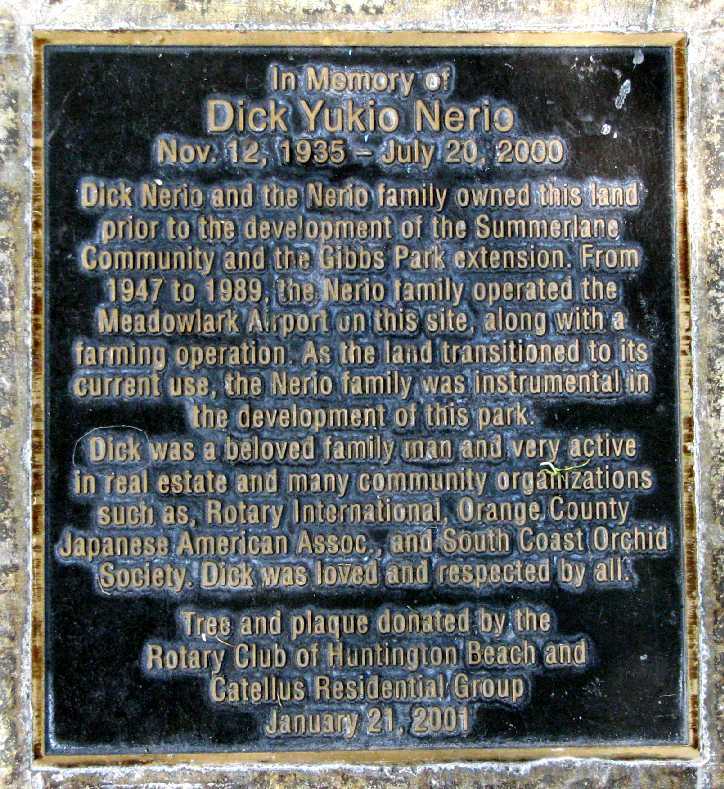 According to the Nerio Family, “After years of neighbors' complaints & rising commercial opportunities, the Nerio family finally closed the airport in September of 1989. 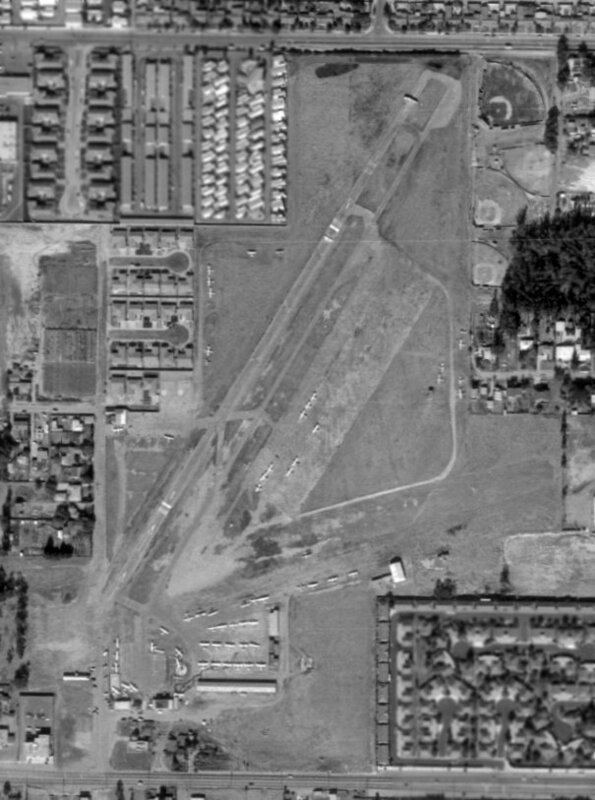 A sad early 1990s aerial view by Dave Stevens looking northwest at the site of Meadowlark Airport, showing the airport buildings being removed. although the majority of the airport property had been cleared for redevelopment. 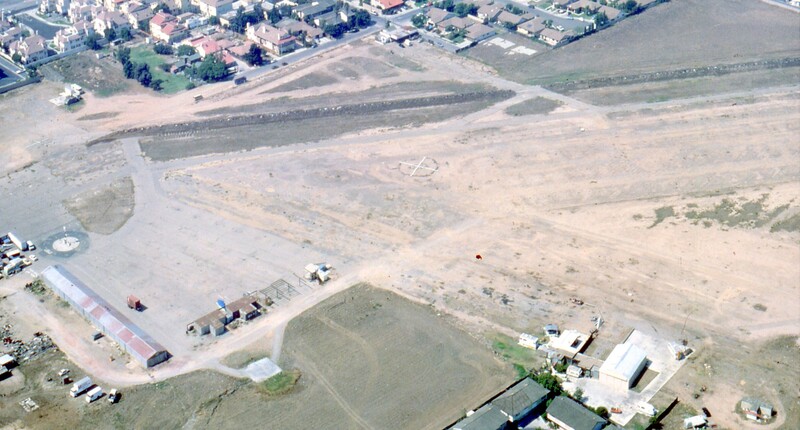 A sad 2000 aerial view looking southeast at the site of Meadowlark Airport, showing it undergoing redevelopment. Denny Sun pointed out in 2006, “The north/south street just to the west of the shopping center is named Airport Circle. in Gibbs Park, within the Summerlane development of the airport site. A 2009-2010 photo (courtesy of Rex Ricks of a mural inside a nearby Trader Joe's grocery store commemorating Meadowlark Airport. 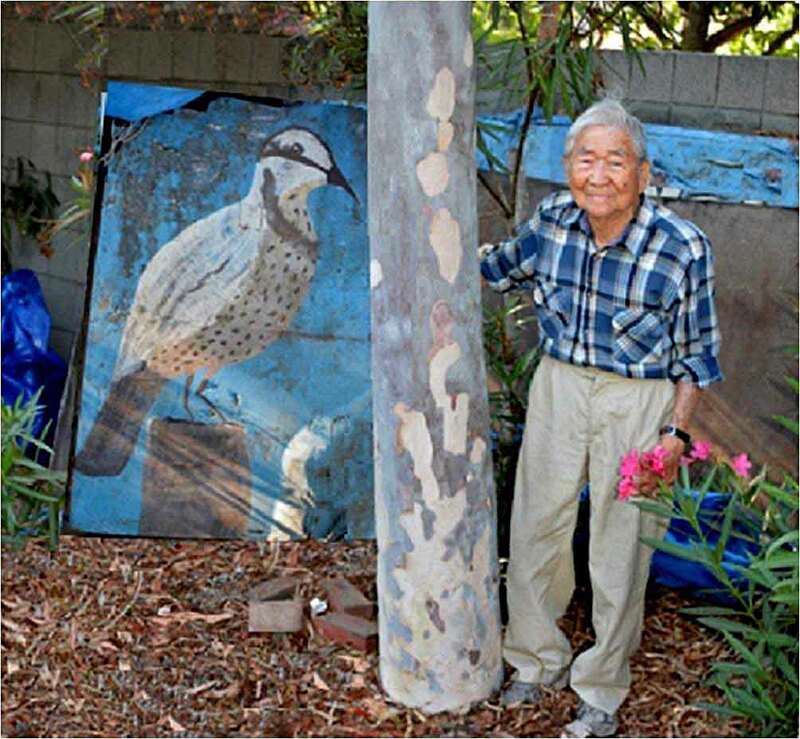 An 8/9/14 photo by Pat Nerio of former Meadowlark Airport owner Art Nerio next to the Meadowlark sign. A 2016 aerial view looking north shows that no trace remains of Meadowlark Airport. Thanks to Scott Saylor for pointing out this airfield. An undated aerial view looing east at the Huntington Beach Airport from the 1932 U.S. Navy Aeronautical Chart (courtesy of Roger Connor). 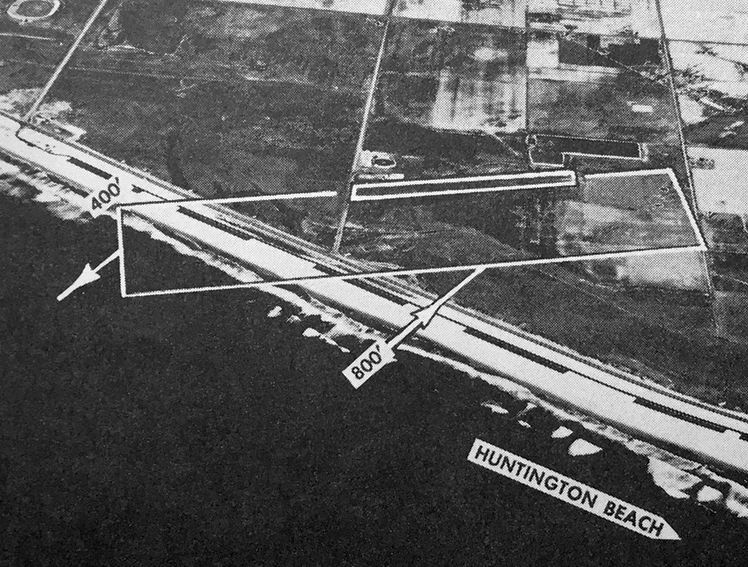 Huntington Beach Airport had the misfortune to be located on what eventually became very expensive real estate. The date of construction of Huntington Beach Airport has not been determined. which depicted it as having a single east/west runway ending directly across the road from the beach. 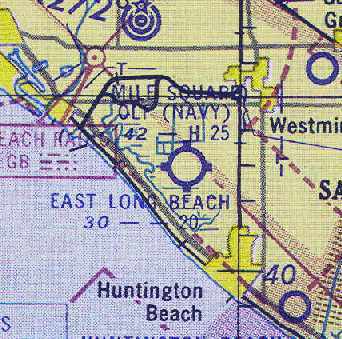 which depicted Huntington Beach as an auxiliary airfield. and/or another airfield located very close in Huntington Beach may have been subsequently created. 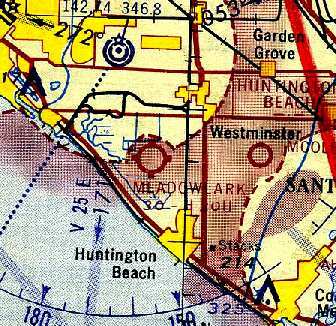 However no airfield in Huntington Beach was depicted on the August 1945 San Diego Sectional Aeronautical Chart (courtesy of Chris Kennedy). depicted the field as having a single northeast/southwest unpaved runway. including an airplane seen halfway down the runway on takeoff, with cloud of sand/dust being blown in the plane's wake. 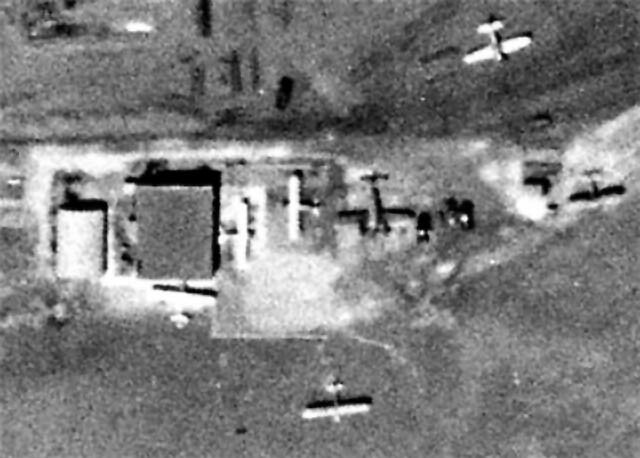 showing several aircraft parked around a few small buildings. The concrete pad & foundations for a future hangar were already in place. 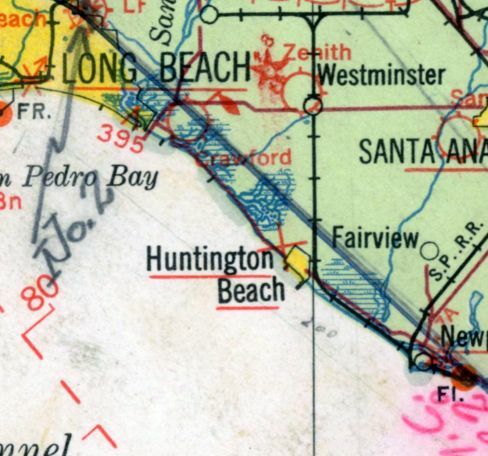 The 1947 USGS topo map labeled the field as “Huntington Beach”. described Huntington Beach Airport as having a 1,900' unpaved runway. was an undated aerial view looking north from the 1950 Air Photo Guide (courtesy of Kevin Walsh). The guide described Huntington Beach Airport as having an 1,800' dirt northeast/southwest runway, and listed the manager as John Garrish. 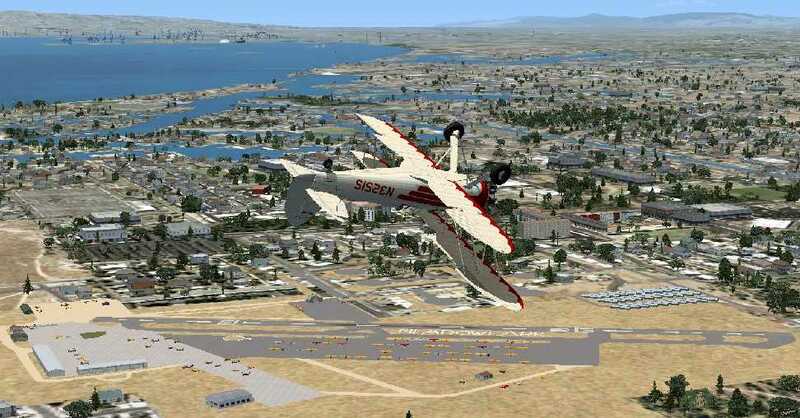 depicted Huntington Beach Airport as having a single northeast/southwest runway. Huntington Beach Airport was apparently closed at some point between 1950-55.
and described as having a single 1,850' bare runway, but the remarks said "Closed". but the airport was no longer operating, and the land was being redeveloped for other use. the former Huntington Beach Airport was no longer depicted at all. after construction of a new stormwater channel & Edison electric power generation station on the former airport property. The airport hangar was relocated approximately 500' to the north & rotated 90 degrees, to the north side of Edison Street. 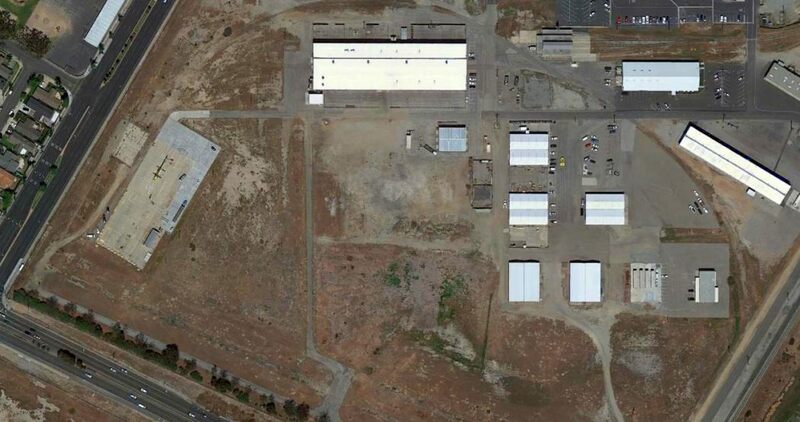 all confirmed that this was the relocated former hangar. 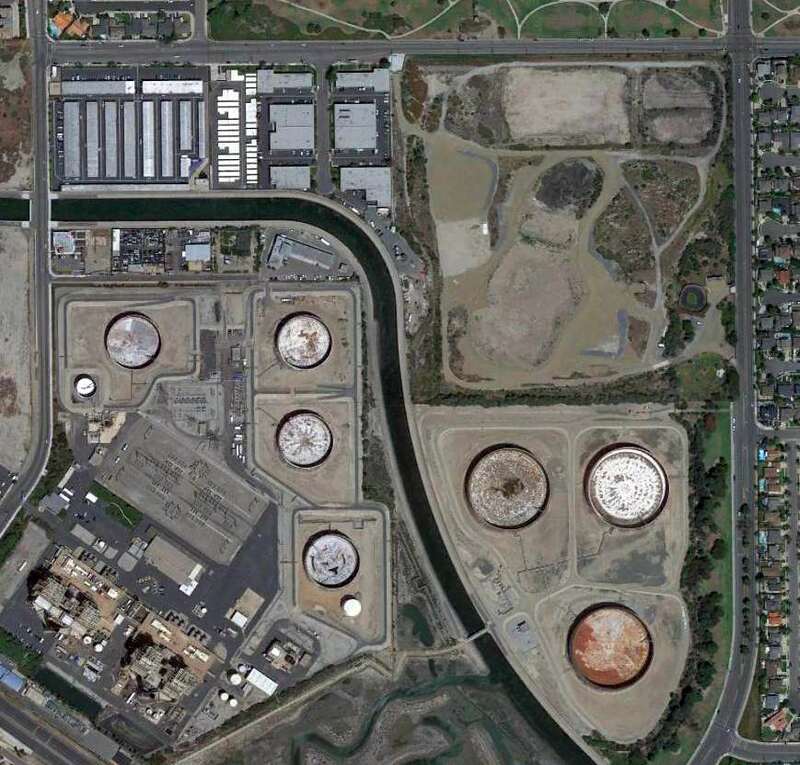 A 1972 aerial photo showed that the site of the former airport had been covered with fuel tanks for the Edison powerplant. 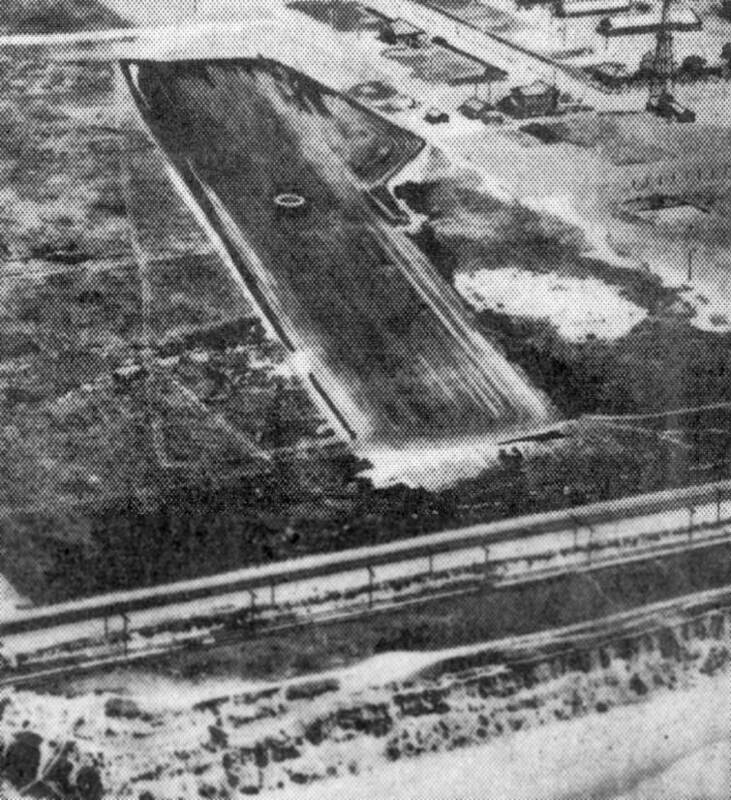 The Huntington Beach Channel also had been cut through the center of the former airfield area. The hangar was the only trace of the former airport which appeared to remain. across the street from the site of Huntington Beach Airport. 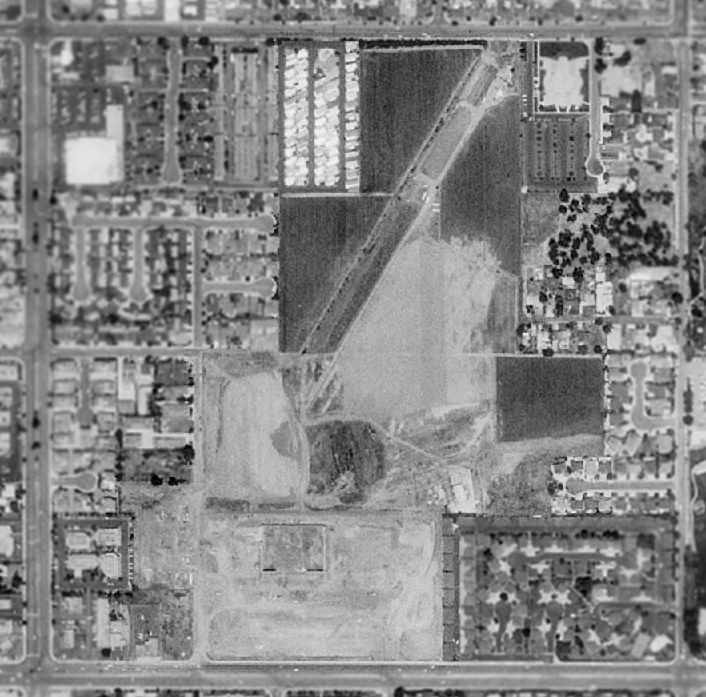 As seen in a 4/16/13 aerial photo, the site of Huntington Beach Airport was no longer recognizable as former airport. 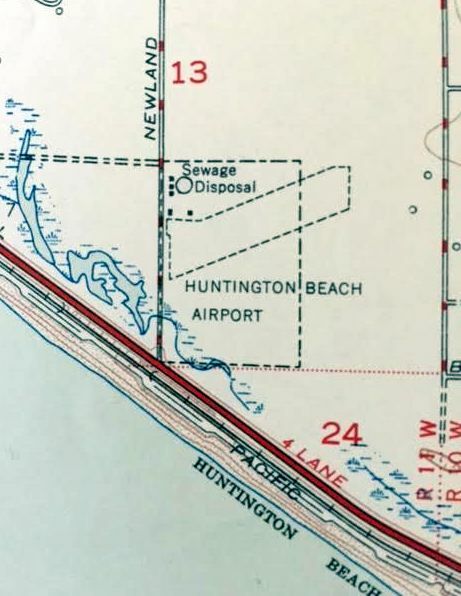 The site of Huntington Beach Airport is located east of the intersection of Newland Street & Edison Avenue. 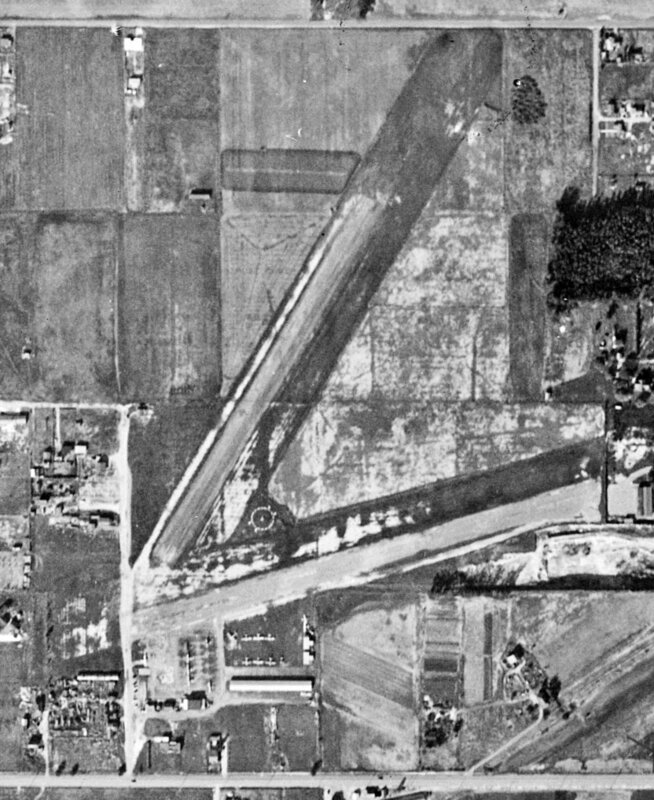 The date of construction of this WW2-era Navy satellite airfield is unknown. the others were Haster Farm NOLF, Mile Square NOLF, Seal Beach NOLF, and Palisades NOLF. Mile Square was built in 1942, so Horse Farm was probably built around the same time. It depicted the field as a paved hexagonal landing mat. including NOLF Horse Farm (08303). 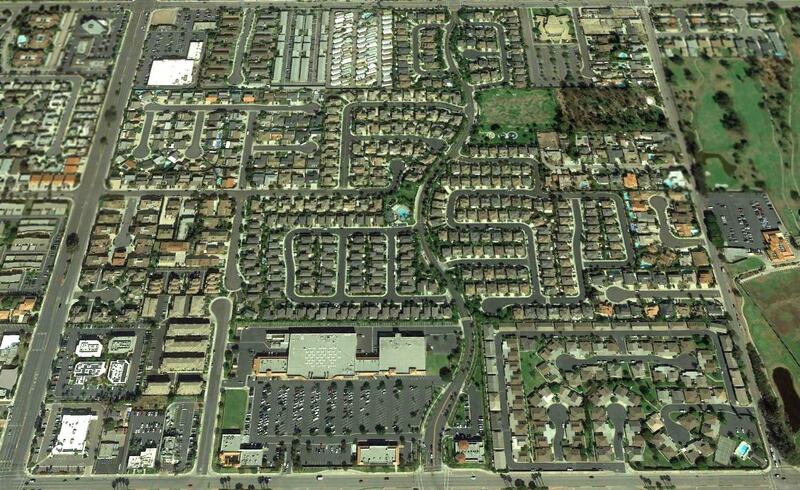 NOLF Seal Beach (21104), as well as 2 “proposed” fields which were never built. in the center of a 3,966' x 2,911' all-way landing area. The field was said to not have any hangars. 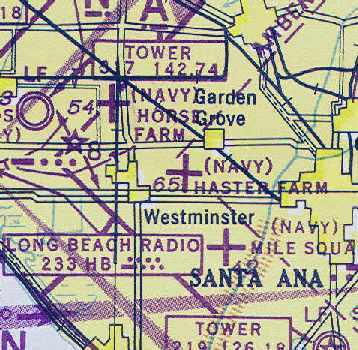 was on the August 1945 San Diego Sectional Aeronautical Chart (courtesy of Chris Kennedy). 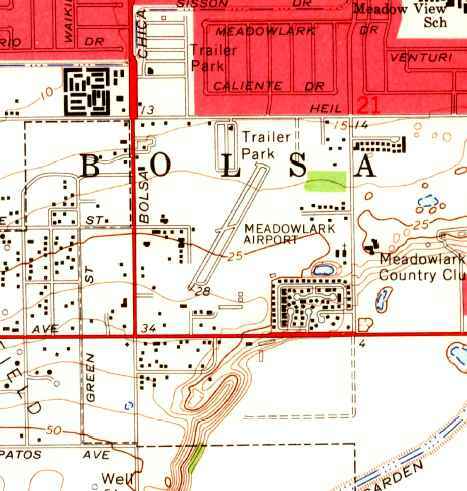 depicted Horse Farm OLF as consisting of a hexagonal landing area, measuring 1,400' across. as it was no longer depicted at all on the February 1946 San Diego Sectional Chart (according to Chris Kennedy). 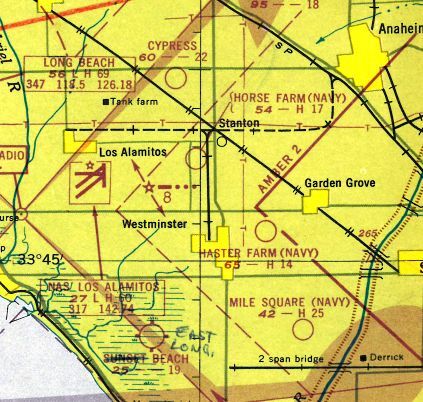 as "Horse Farm (Navy)” was depicted once again on the 1947 LA Local Aeronautical Chart (courtesy of Tim Zukas). It was depicted as having a 1,700' paved runway. depicted "Horse Farm (Navy)” as having a 1,700' hard surface runway. the airfield at Horse Farm consisted of a hexagonal landing area, measuring 1,400' across. but it is not known if it was still an active airfield. 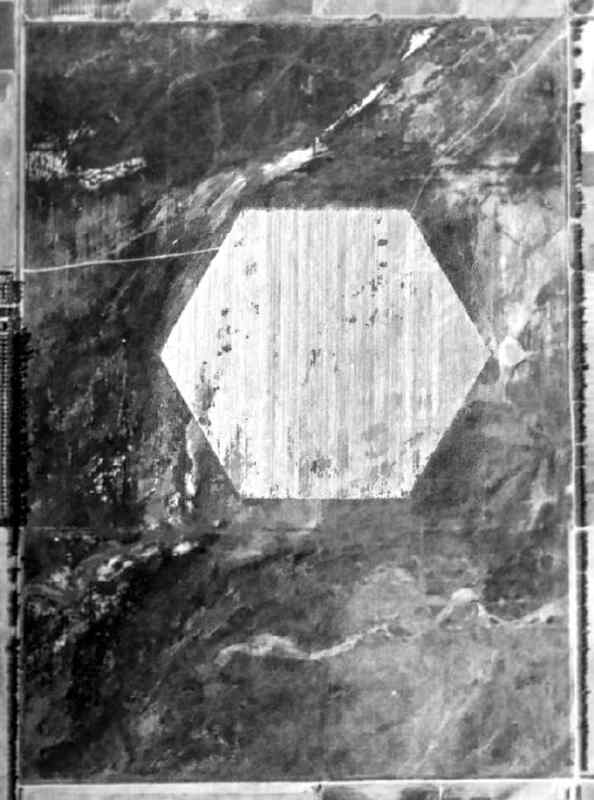 A 1953 aerial view depicted the hexagonal landing area, but without any sign of current usage. as that is how it was described in the "Aerodromes" table on an early-1955 San Diego Sectional Aeronautical Chart (courtesy of John Voss). The airfield was described as consisting of a single 1,700' runway, along with the remarks "Very poor runway." as it was no longer depicted on the September 1955 San Diego Sectional Chart (courtesy of Chris Kennedy) or subsequent aeronautical charts. and the airfield was presumably closed. and the Launch Site was built at the southeast corner of the site (northwest of Chapman & Western). Battery LA-32 was upgraded to the more powerful Nike Hercules missile in 1963. The Horse Farm property in 1964, from the Anaheim Library (courtesy of Scott O'Donnell). and the Nike Launch Site is at the southeast corner. but presumably was a swath which was cleared to provide a clear field of view for the Nike radars - ? There was no trace remaining of the former hexagonal landing pad. with the Nike installations at the northwest & southeast ends. The Horse Farm Nike missile battery was deactivated in 1974. The 485th MASH of the CA Army National Guard later reused part of the Horse Farm property, at 11751 Western Avenue. According to Marc Henegar, “This was also where one of the SoCal TRACON terminal radar antennas was located. The site of the Horse Farm airfield eventually was consumed by urban sprawl. 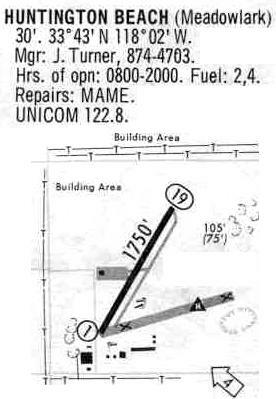 The outline of the Horse Farm airfield, as annotated by Chris Kennedy over a 2006 aerial photo of the site. Not a trace remains of the former airfield. which is identical to the way it appeared in the 1964 photo. Knott Avenue on the west, and Western Avenue on the east. A July 21, 1943 U.S. Government aerial photo looking north at Haster Farm OLF (National Archives photo, courtesy of Brian Rehwinkel). the others were Horse Farm NOLF, Mile Square NOLF, Seal Beach NOLF, and Palisades NOLF. Mile Square was built in 1942, so Haster Farm was probably built around the same time. 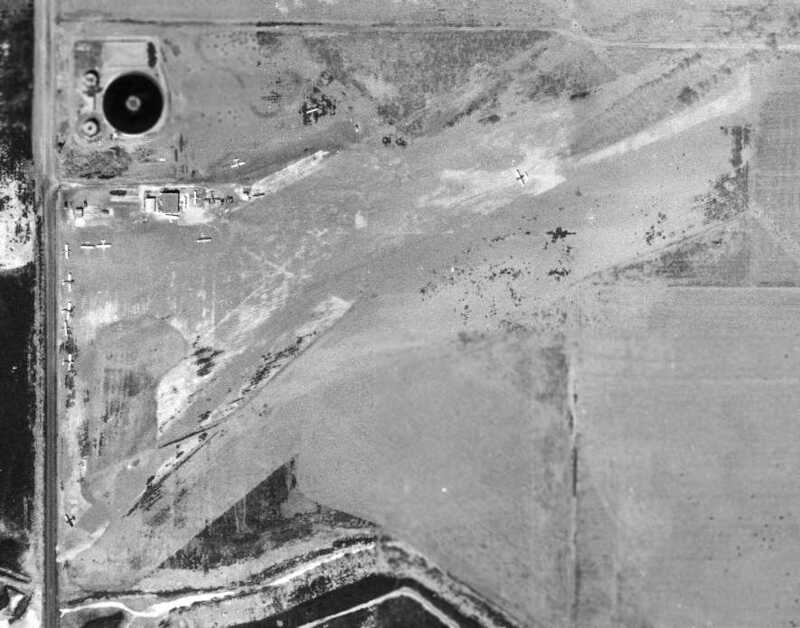 was on a 7/21/43 U.S. Government aerial photo (National Archives photo, courtesy of Brian Rehwinkel). It depicted the field as consisting of a hexagonal landing area. 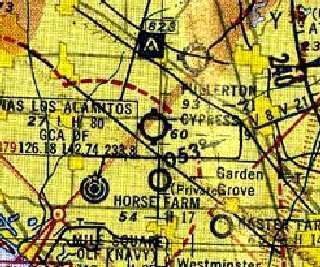 A circa 1943 chart of NAS Los Alamitos & several of its outlying fields (courtesy of John Voss), including NOLF Haster Farm (11005). as a 241 acre rectangular property within which was a 1,500' diameter asphalt hexagonal landing mat in the center of a 3,983' x 2,645' all-way landing area. 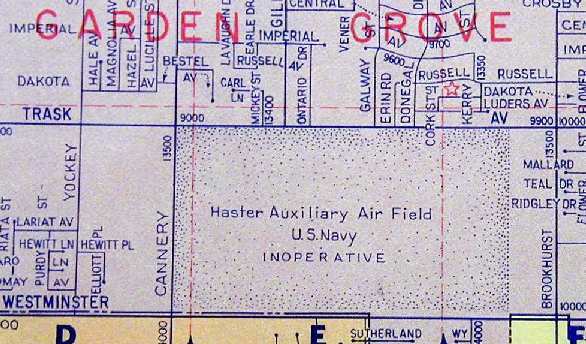 depicted "(Navy) Haster Farm" as an auxiliary airfield. Judy Whilson recalled, “In about 1945 my father bought a 10-acre farm at 9141 Trask Avenue, facing Haster Field. Mr. Haster lived across the street & a little to the south. My brother & I spent lots of hours on our bicycles on the abandoned airfield among the weeds. At about that time my parents divorced & mom took off in her Luscombe to do cropdusting in Tulare with her boyfriend. She would call before she came to visit & we would clear tumble weeds so she could land. She landed on Haster Field. It was paved, but the weeds were coming up through the cracks. Where she landed is approximately where the freeway is now. Later she & Art bought a ranch in Mexico. When she came up to the states, her cockpit was full of tiny cages with parrots in them. Once the cages had broken & the parrots escaped as soon as she opened the door. 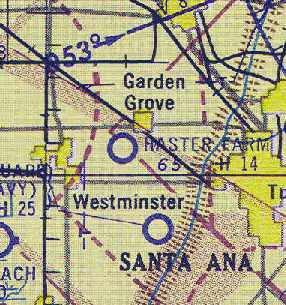 as "Haster Farm (Navy)” was depicted once again on the 1947 LA Local Aeronautical Chart (courtesy of Tim Zukas). It was depicted as having a 1,400' paved runway. 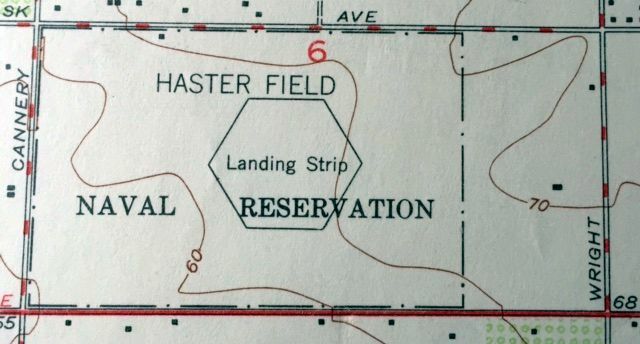 The 1947 USGS topo map labeled the field as “Haster Farm”. so apparently the property was still owned by the military at that point, but it may not have still been an active airfield. 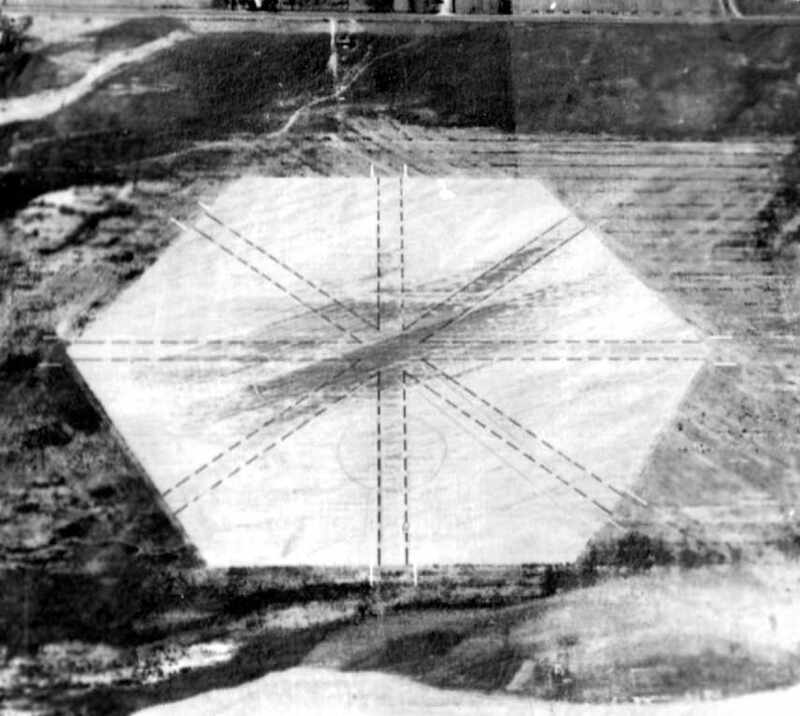 The map depicted the airfield as a hexagonal landing mat. 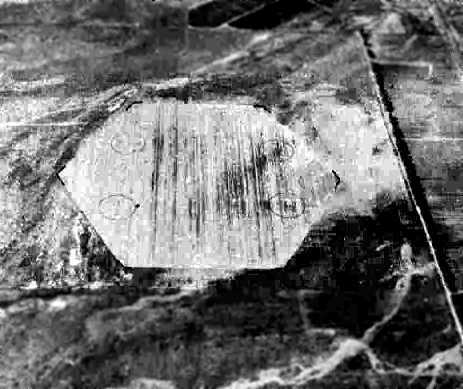 A 1953 aerial view depicted Haster Field's hexagonal landing area, but without any sign of current usage. as that is how it was depicted on the September 1955 San Diego Sectional Aeronautical Chart (courtesy of Chris Kennedy). along with the remarks "Very poor. Heavy overgrowth of weeds." Bob Cannon recalled, "I have a 1956 LA Local [Aeronautical Chart]. Haster Farm is listed as 'Very poor. Heavy overgrowth of weeds'. I show in my log book that on 6/30/56 I landed at Haster Farm with the notation, 'into weeds'." North of Westminster (17th) Avenue & East of Canery Road (Magnolia Avenue). There were about 6 various airplanes stored there back then. We flew in a Piper Cub, with the pilot in the front, my Dad in the second seat tandem, and I was packed into the leather luggage sling behind my Dad. Brookhurst Avenue on the east, and Cannery Street on the west. adjacent to the open field where they later built the 22 freeway, Atlantis & Garden Grove Park. of Haster High School (later renamed Bolsa Grande High School) and Garden Grove Park. The 22 Freeway now bisects the northern portion of the site. 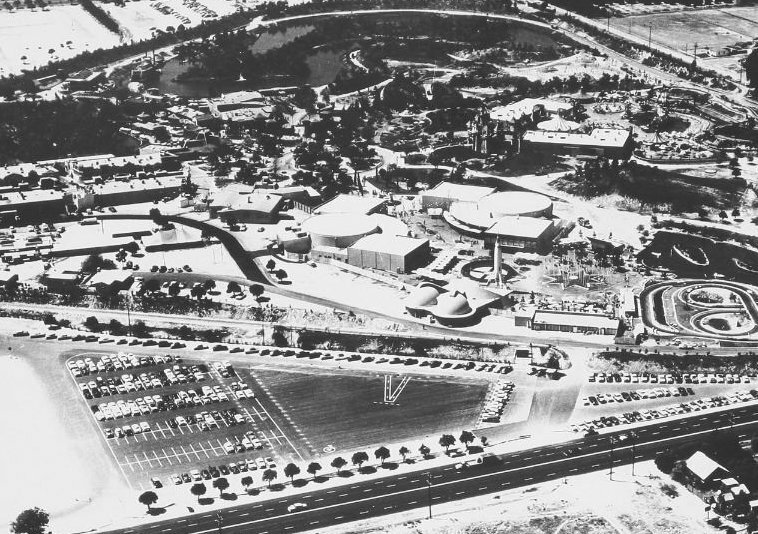 A 1972 aerial view showed the high school on the site, with not a trace of the former airfield. The outline of the Haster Farm airfield, as annotated by Chris Kennedy over a 2006 aerial photo of the site.